Ms Stacey Donison, as Stenographer. western Caribbean (for the geographical context of the case, see sketch-map below). In its Application, Nicaragua seeks to found the jurisdiction of the Court on the provisions of Article XXXI of the American Treaty on Pacific Settlement signed on 30 April 1948, officially designated, according to Article LX thereof, as the �Pact of Bogota� (hereinafter referred to as such) as well as on the declarations made by the Parties under Article 36 of the Statute of the Permanent Court of International Justice, which are deemed, for the period which they still have to run, to be acceptances of the compulsory jurisdiction of the present Court pursuant to Article 36, paragraph 5, of its Statute. that Article, all other States entitled to appear before the Court were notified of the Application. 3. Pursuant to the instructions of the Court under Article 43 of the Rules of Court, the Registrar addressed to States parties to the Pact of Bogota the notifications provided for in Article 63, paragraph 1, of the Statute of the Court. In accordance with the provisions of Article 69, paragraph 3, of the Rules of Court, the Registrar moreover addressed to the Organization of American States (hereinafter the �OAS�) the notification provided for in Article 34, paragraph 3, of the Statute. The Registrar subsequently transmitted to that organization copies of the pleadings filed in the case and asked its Secretary-General to inform him whether or not it intended to present observations in writing within the meaning of Article 69, paragraph 3, of the Rules of Court. The OAS indicated that it did not intend to submit any such observations. 4. Since the Court included upon the Bench no judge of the nationality of either of the Parties, each Party proceeded to exercise its right conferred by Article 31, paragraph 3, of the Statute to choose a judge ad hoc to sit in the case. Nicaragua first chose Mr. Mohammed Bedjaoui, who resigned on 2 May 2006, and subsequently Mr. Giorgio Gaja. Colombia chose Mr. Yves Fortier. 5. By an Order dated 26 February 2002, the Court fixed 28 April 2003 as the time-limit for the filing of the Memorial of Nicaragua and 28 June 2004 as the time-limit for the filing of the Counter-Memorial of Colombia. Nicaragua filed its Memorial within the time-limit so prescribed. 6. On 21 July 2003, within the time-limit set by Article 79, paragraph 1, of the Rules of Court, as amended on 5 December 2000, Colombia raised preliminary objections to the jurisdiction of the Court. Consequently, by an Order dated 24 September 2003, the Court, noting that by virtue of Article 79, paragraph 5, of the Rules of Court, the proceedings on the merits were suspended, fixed 26 January 2004 as the time-limit for the presentation by Nicaragua of a written statement of its observations and submissions on the preliminary objections made by Colombia. Nicaragua filed such a statement within the time-limit so prescribed, and the case thus became ready for hearing in respect of the preliminary objections. and documents annexed in the case. Having ascertained the views of the Parties pursuant to Article 53, paragraph 1, of the Rules of Court, the Court decided to grant these requests. The Registrar duly communicated these decisions to the said Governments and to the Parties. 8. On 4 June 2007, Colombia, referring to Article 56, paragraph 4, of the Rules of Court and Practice Directions IXbis and IXter, transmitted to the Court four documents and the certified English translations thereof, to which it intended to refer during the oral proceedings. 9. In accordance with Article 53, paragraph 2, of the Rules of Court, the Court decided, after ascertaining the views of the Parties, that copies of the pleadings and documents annexed would be made accessible to the public on the opening of the oral proceedings. �Whilst the principal purpose of this Application is to obtain declarations concerning title and the determination of maritime boundaries, the Government of Nicaragua reserves the right to claim compensation for elements of unjust enrichment consequent upon Colombian possession of the Islands of San Andres and Providencia as well as the keys and maritime spaces up to the 82 meridian, in the absence of lawful title. The Government of Nicaragua also reserves the right to claim compensation for interference with fishing vessels of Nicaraguan nationality or vessels licensed by Nicaragua. �1. For the reasons advanced, the Republic of Nicaragua requests the Court to adjudge and declare that the Preliminary Objections submitted by the Republic of Colombia, both in respect of the jurisdiction based upon the Pact of Bogota, and in respect of the jurisdiction based upon Article 36, paragraph 2, of the Statute of the Court, are invalid. 2. In the alternative, the Court is requested to adjudge and declare, in accordance with the provisions of Article 79, paragraph 9, of the Rules of Court that the objections submitted by the Republic of Colombia do not have an exclusively preliminary character. 3. In addition, the Republic of Nicaragua requests the Court to reject the request of the Republic of Colombia to declare the controversy submitted to it by Nicaragua under Article XXXI of the Pact of Bogota �ended�, in accordance with Articles VI and XXXIV of the same instrument. 1. The Preliminary Objections submitted by the Republic of Colombia, both in respect of the jurisdiction based upon the Pact of Bogota, and in respect of the jurisdiction based upon Article 36, paragraph 2, of the Statute of the Court, are invalid. 14. For the sake of convenience, the preliminary objection raised by Colombia relating to the Court�s jurisdiction under the Pact of Bogota will hereinafter be referred to as the �first preliminary objection�. The preliminary objection raised by Colombia relating to the Court�s jurisdiction under the optional clause declarations made by the Parties will hereinafter be referred to as the �second preliminary objection�. 15. Before becoming independent in 1821, Nicaragua was a colonial province under the rule of Spain. Thereafter, Nicaragua together with Guatemala, El Salvador, Honduras and Costa Rica formed the Federal Republic of Central America, also known as the United Provinces of Central America and as the Central American Federation. In 1838 Nicaragua seceded from the Federal Republic, maintaining the territory it had before. The Federal Republic disintegrated in the period between 1838 and 1840. In a Treaty of 25 July 1850, Spain recognized the independence of Nicaragua. 16. The territory which is now Colombia was also under the rule of Spain and formed part of the Viceroyalty of New Granada. In 1810 the provinces of the Viceroyalty of New Granada declared independence from Spain. In 1819 the Republic of �Great Colombia� was formed. It included the territories of the former Captaincy-General of Venezuela and the Viceroyalty of New Granada. In 1830 Venezuela and Ecuador seceded from the Republic of �Great Colombia�. The remaining territory was named the Republic of New Granada in 1832. The name of the Republic was changed to Granadine Confederation in 1858 and the 1863 Constitution created the United States of Colombia. On 30 January 1881 Spain and the United States of Colombia concluded a Treaty of Peace and Amity. Under a new constitution adopted in 1886, the United States of Colombia was renamed the Republic of Colombia. The territorial scope of the State remained unchanged between 1830 and 1903 when Panama, the territory of which had formed part of the Republic of Colombia, seceded and became a separate State. 17. On 15 March 1825 the United Provinces of Central America and Colombia signed the Treaty of Perpetual Union, League and Confederation. In Article VII of that Treaty, both parties agreed to respect their boundaries as they existed at that time and to settle the �demarcation or divisional line� between them in due course. In the period that followed, a number of claims were made by Nicaragua and Colombia over the Mosquito Coast and the Archipelago of San Andres. �The Republic of Colombia recognises the full and entire sovereignty of the Republic of Nicaragua over the Mosquito Coast between Cape Gracias a Dios and the San Juan River, and over Mangle Grande and Mangle Chico Islands in the Atlantic Ocean (Great Corn Island and Little Corn Island). The Republic of Nicaragua recognises the full and entire sovereignty of the Republic of Colombia over the islands of San Andres, Providencia and Santa Catalina and over the other islands, islets and reefs forming part of the San Andres Archipelago. The Court has noted that there are certain differences between the original Spanish text of the 1928 Treaty and the French and English translations prepared by the Secretariat of the League of Nations. In particular, the term �cayos� in Spanish, which appears in the first and second paragraphs of Article I of the Treaty, is translated as �r�cifs� in French and �reefs� in English rather than �cays�. For the purposes of the present Judgment, the Court will, in quotations, use the translation prepared by the League of Nations. However, it will employ the word �cays� rather than �reefs� when the Court itself refers to the first paragraph of Article I and will not use any geographical qualification when referring to Roncador, Quitasue�o and Serrana, the three maritime features named in the second paragraph of Article I. This approach is without prejudice to the physical and legal characterization of these features. 19. On 10 April 1928 Colombia and the United States of America (hereinafter the �United States�) exchanged Notes concerning the status of Roncador, Quitasue�o and Serrana. Colombia undertook to �refrain from objecting to the maintenance by the United States of the services which it has established or may establish on said cays to aid navigation� and the United States undertook to �refrain from objecting to the utilization, by Colombian nationals, of the waters appurtenant to the Islands for the purpose of fishing�. 21. In a diplomatic Note, dated 4 June 1969, from the Ambassador of Colombia to Nicaragua to the Minister for Foreign Affairs of Nicaragua, Colombia protested against the granting of certain oil exploration concessions and reconnaissance permits by Nicaragua, which allegedly covered Quitasue�o and the waters surrounding it as well as maritime zones that surpassed the 82nd meridian to the east. With respect to Quitasue�o, Colombia pointed out that the 1928 Treaty explicitly declared that the Roncador, Quitasue�o and Serrana cays were in dispute between Colombia and the United States. It requested Nicaragua �to remedy the error or inadvertence that may have been incurred by exercising acts of domain or disposition over a good that is solemnly acknowledged as outside of Nicaraguan jurisdiction or sovereignty�. Colombia also made �a formal reservation . . . of its rights over the referenced territory, as well as over the adjacent maritime zone�. With respect to the maritime zones over which oil exploration concessions had been granted, Colombia observed that the 82nd meridian had been noted in the 1930 Protocol as the western boundary of the Archipelago of San Andres and Providencia. Colombia asserted that it had �clear and indisputable . . . rights over that [maritime] zone� which it formally reserved and stated that it trusted that Nicaragua �shall find it appropriate and adequate to revoke [the concessions] or reform them to the extent that they exceed the limit of Nicaraguan national jurisdiction and invade Colombian domain�. 22. In a diplomatic Note, dated 12 June 1969, to the Ambassador of Colombia to Nicaragua, the Minister for Foreign Affairs of Nicaragua stated that his Government would carefully consider the question of the oil reconnaissance permit granted over the Quitasue�o area while reserving its rights to the continental shelf. With respect to the oil exploration concessions, Nicaragua asserted that the areas concerned were part of its continental shelf and that the concessions had therefore been granted �in use of the sovereign rights [Nicaragua] fully and effectively exercises in accordance with the norms of international law�. As to the reference to the 82nd meridian in the 1930 Protocol, Nicaragua asserted that �[a] simple reading of the . . . texts makes it clear that the objective of this provision is to clearly and specifically establish in a restrictive manner, the extension of the Archipelago of San Andres, and by no valid means can it be interpreted as a boundary of Nicaraguan rights or creator of a border between the two countries. On the contrary, it acknowledges and confirms the sovereignty and full domain of Nicaragua over national territory in that zone�. 23. In a Note in response, dated 22 September 1969, the Minister for Foreign Affairs of Colombia, inter alia, made a �formal declaration of sovereignty in the maritime areas located East of Meridian 82 of Greenwich�, relying on the �definitive and irrevocable character of the  Treaty on Boundaries� and �[t]he declaration by the . . .  Protocol . . . that the dividing line between respective maritime areas or zones was set at Greenwich Meridian 82�. He also pointed to the exclusion in the 1928 Treaty of the Roncador, Quitasue�o and Serrana cays �from any negotiations between Colombia and Nicaragua�. 24. In 1971 Colombia and the United States engaged in negotiations regarding the status of Roncador, Quitasue�o and Serrana. On 23 June 1971, the Minister for Foreign Affairs of Nicaragua sent a memorandum to the Department of State of the United States formally reserving its rights over its continental shelf in the area around Roncador, Quitasue�o and Serrana and noting that it considered those banks to be part of its continental shelf. It further stated that it could not accept Colombia�s contention that the 82nd meridian referred to in the 1930 Protocol set the dividing line between the respective maritime zones of the two States since it only constituted the limit of the San Andres Archipelago. In a Note, dated 6 December 1971, the Secretary of State of the United States assured the Ambassador of Nicaragua in Washington that the United States would take into account Nicaragua�s rights over the continental shelf. 25. On 8 September 1972, Colombia and the United States signed the Treaty concerning the status of Quitasue�o, Roncador and Serrana (also known as and hereinafter the Vasquez-Saccio Treaty), the preamble of which stated that the two States were �[d]esirous of settling the long-standing questions concerning the status of Quita Sue�o, Roncador and Serrana�. Article 1 of the Treaty provided that �the Government of the United States hereby renounces any and all claims to sovereignty over Quita Sue�o, Roncador and Serrana�. Each State agreed not to interfere with the fishing activities of the other State in the waters adjacent to Quitasue�o. With respect to Roncador and Serrana, the Treaty stipulated that Colombia would guarantee nationals and vessels of the United States a continuation of fishing rights in the waters adjacent to those cays. 26. On the same day as the signature of the Vasquez-Saccio Treaty, there was an Exchange of Notes between Colombia and the United States concerning their �legal position respecting Article 1 of [the] Treaty�. The United States affirmed that its legal position was, inter alia, that �Quita Sue�o, being permanently submerged at high tide, is at the present time not subject to the exercise of sovereignty� and that the 1928 Treaty did not apply to Roncador, Quitasue�o and Serrana. For its part, Colombia stated that its position was that the �[t]he physical status of Quita Sue�o is not incompatible with the exercise of sovereignty� and that �with the renunciation of sovereignty by the United States over Quita Sue�o, Roncador, and Serrana, the Republic of Colombia is the only legitimate title holder on those banks or cays, in accordance with the [1928 Treaty and 1930 Protocol] and international law�. 27. On 4 October 1972, the National Assembly of Nicaragua adopted a formal declaration proclaiming Nicaraguan sovereignty over Roncador, Quitasue�o and Serrana. On 7 October 1972, the Minister for Foreign Affairs of Nicaragua sent diplomatic Notes to the Minister for Foreign Affairs of Colombia and the Secretary of State of the United States formally protesting against the signing of the Vasquez-Saccio Treaty and maintaining that �the banks located in that zone . . . are part of [Nicaragua�s] territory and therefore subject to its sovereignty�. The Minister added that his Government could not accept Colombia�s contention that the 82nd meridian referred to in the 1930 Protocol constituted the boundary line of the respective maritime areas of the two States since it did not coincide with the letter or spirit of the Protocol, the clear intention of which was to specify that the San Andres Archipelago did not extend west further than the 82nd meridian. The Minister further noted that the continental shelf concept had not been recognized at the time of the signing of the 1928 Treaty and 1930 Protocol and that, consequently, Nicaragua could not at that time have relinquished rights that had not yet been acknowledged. �the nullity and lack of validity of the B�rcenas-Meneses-Esguerra Treaty [the 1928 Treaty] . . . [concluded] in a historical context which incapacitated as rulers the presidents imposed by the American forces of intervention in Nicaragua and which infringed . . . the principles of the National Constitution in force . . .�. The White Paper acknowledged that �[a] great deal of time has passed since the [1928 Treaty]� but pointed out that �it was only on 19 July 1979 that Nicaragua recovered its national sovereignty�. On 5 February 1980, the Minister for Foreign Affairs of Colombia addressed a diplomatic Note to his counterpart in Nicaragua, stating that his Government rejected the declaration of 4 February 1980 as �an unfounded claim that counters historical reality and breaches the most elementary principles of public international law�. He also affirmed that, in the view of his Government, the 1928 Treaty �[was] a valid, perpetual instrument, and in full force in light of the universally recognized legal norms�. 29. From 1976 to 1981 there were several exchanges of diplomatic Notes between Nicaragua and the United States concerning the status of Roncador, Quitasue�o and Serrana in the context of the process of ratification by the United States of the Vasquez-Saccio Treaty. On 16 July 1981, the United States presented Nicaragua with an aide-memoire entitled �United States Legal Position� which stated, inter alia, that the United States had not taken and did not intend to take any position regarding the legal merits of the competing claims of Colombia and Nicaragua over Roncador, Quitasue�o and Serrana. On 17 September 1982, the Vasquez-Saccio Treaty came into force following the exchange of instruments of ratification between Colombia and the United States. 30. The new government which came to power in Nicaragua in 1990 and subsequent governments maintained the position with regard to the meaning of certain provisions of the 1928 Treaty and 1930 Protocol which had been stated from 1969 onwards and the position with regard to the invalidity of the 1928 Treaty which had been set out in the 1980 White Paper. the co-ordinates given by Colombia, they would still have been within Nicaraguan waters. He added that the claim of Colombian sovereignty over those waters was �totally inadmissible and baseless�. Between 1995 and 2002, there followed similar seizures of vessels by both Colombia and Nicaragua. 32. In 1977, 1995 and 2001, meetings took place between officials of the Nicaraguan and Colombian Ministries of Foreign Affairs concerning contentious issues between the two States. The Parties do not agree on the content and significance of those discussions. 33. The Court initially notes that the Parties have presented different views about whether there is an extant dispute between them and, if so, the subject-matter of that dispute. Consequently, before addressing the preliminary objections raised by Colombia, it is necessary for the Court to examine these issues. 34. The Court recalls that in its Application, Nicaragua stated that �[t]he dispute consists of a group of related legal issues subsisting between the Republic of Nicaragua and the Republic of Colombia concerning title to territory and maritime delimitation�. It noted that �the definitive settlement of . . . issues of [territorial] title must constitute a condition precedent to the complete and definitive determination of the maritime areas�. 35. In its written pleadings, Nicaragua submitted that �[t]he core of the dispute relates to the maritime delimitation between the Parties�, asserting that �the subject-matter of the dispute is the determination of a single maritime boundary� and that �the issue of title is not the subject-matter of the dispute but a necessary prerequisite� for the definitive determination of the maritime areas. 36. Nicaragua asserted that the dispute submitted to the Court concerned (i) the validity of the 1928 Treaty and its termination due to material breach; (ii) the interpretation of the 1928 Treaty, particularly regarding the geographical scope of the San Andres Archipelago; (iii) the legal consequences of the exclusion from the scope of the 1928 Treaty of Roncador, Quitasue�o and Serrana; and (iv) the maritime delimitation between the Parties including the legal significance of the reference to the 82nd meridian in the 1930 Protocol. In its view, the fourth element �implie[d] and encompasse[d] all the others�. In this regard, Nicaragua contended that the question of sovereignty over the maritime features was both accessory and preliminary to that of maritime delimitation. That is, even if the case were limited to a maritime delimitation, it would be necessary for the Court first to resolve the question of territorial title over the maritime features in the disputed area. Finally, Nicaragua also submitted that the question whether the 1928 Treaty has settled all questions between the Parties is �the very object of the dispute� and �the substance of the case�. 37. Colombia denied that there was an extant dispute over which the Court could have jurisdiction, claiming that the matters in issue had already been settled by the 1928 Treaty. It further contended that the real purpose behind Nicaragua�s Application was maritime delimitation rather than the determination of sovereignty over the maritime features. 39. As a preliminary point, the Court recalls that the Parties disagree on whether or not the dispute between them had been �settled� by the 1928 Treaty within the meaning of Article VI of the Pact of Bogota. The Court first notes that Article VI of the Pact provides that the dispute settlement procedures in the Pact �may not be applied to matters already settled by arrangement between the parties, or by arbitral award or by decision of an international court, or which are governed by agreements or treaties in force on the date of the conclusion of the present Treaty� (emphasis added). The Court also notes that according to Article XXXIV of the Pact controversies over matters which are governed by agreements or treaties shall be declared �ended� in the same way as controversies over matters settled by arrangement between the parties, arbitral award or decision of an international court. The Court considers that, in the specific circumstances of the present case, there is no difference in legal effect, for the purpose of applying Article VI of the Pact, between a given matter being �settled� by the 1928 Treaty and being �governed� by that Treaty. In light of the foregoing, the Court will hereafter use the word �settled�. 40. The Court notes that Nicaragua submitted that issues relating to the validity and alleged termination of the 1928 Treaty as well as the question whether the Treaty and its 1930 Protocol covered or resolved all the contentious matters between the Parties, including the geographical scope of the San Andres Archipelago, sovereignty over Roncador, Quitasue�o and Serrana and maritime delimitation, all formed part of the dispute before the Court (see paragraph 36 above). In the Court�s view, all those issues relate to the single question whether the 1928 Treaty and 1930 Protocol settled the matters in dispute between the Parties concerning sovereignty over the islands and maritime features and the course of the maritime boundary. The Court considers, however, that this does not form the subject-matter of the dispute between the Parties and that, in the circumstances of the present case, the question is a preliminary one (see paragraphs 49 to 52 below). 41. With respect to Colombia�s contention that Nicaragua�s true interest lay in the maritime delimitation rather than in sovereignty over the maritime features, the Court notes that nonetheless �the claim of one party is positively opposed by the other� as to sovereignty over the maritime features (see South West Africa (Ethiopia v. South Africa; Liberia v. South Africa), Preliminary Objections, Judgment, I.C.J. Reports 1962, p. 328). 42. In light of the foregoing, the Court concludes that the questions which constitute the subject-matter of the dispute between the Parties on the merits are, first, sovereignty over territory (namely the islands and other maritime features claimed by the Parties) and, second, the course of the maritime boundary between the Parties. 43. The Court recalls that in its first preliminary objection, Colombia claims that pursuant to Articles VI and XXXIV of the Pact of Bogota, the Court is without jurisdiction under Article XXXI of the Pact to hear the controversy submitted to it by Nicaragua and should declare the controversy ended (for the text of Articles VI, XXXI and XXXIV of the Pact of Bogota, see paragraphs 55 and 56 below). In this regard, Colombia, referring to Article VI of the Pact, argues that the matters raised by Nicaragua were settled by a treaty in force on the date on which the Pact was concluded, namely the 1928 Treaty and the 1930 Protocol. Colombia adds that this question can and must be considered at the preliminary objections stage. 44. Nicaragua claims that the Court has jurisdiction under Article XXXI of the Pact of Bogota. In this regard, Nicaragua argues that the 1928 Treaty and its 1930 Protocol did not settle the dispute between Nicaragua and Colombia within the meaning of Article VI of the Pact of Bogota because the 1928 Treaty was invalid or had been terminated and that, even if that was not the case, the 1928 Treaty did not cover all the matters now in dispute between the Parties. Moreover, Nicaragua contends that the Court may not pronounce upon these issues at this stage of the proceedings since that would require an examination of the merits of the case. 45. The Court initially notes that the Parties disagree on whether the questions raised by the first preliminary objection may be examined at this stage of the proceedings. 46. Citing Article 79, paragraph 9, of the Rules of Court, Nicaragua considers that the Court cannot at this stage of the proceedings pronounce upon Colombia�s first preliminary objection because �[i]t is difficult to find a better example of an objection that �does not possess, in the circumstances of the case, an exclusively preliminary character��. In this regard, it argues that the �point raised by the objection and those arising on the merits �are too intimately related and too closely interconnected��. Nicaragua considers that if the Court �were to accept what Colombia is requesting, it would not be upholding a preliminary objection to its jurisdiction, but ruling in favour of Colombia on the merits of the dispute referred to it by Nicaragua�. Nicaragua contends that the Court cannot �without a thorough examination of the merits� decide questions such as whether or not the 1928 Treaty is valid, what meaning to ascribe to the term �San Andres Archipelago� and the course of the maritime boundary between the Parties. Nicaragua notes that, in the ICAO Council case, the Court upheld the principle that �a decision on jurisdiction can never directly decide any question of merits� (Appeal relating to the Jurisdiction of the ICAO Council (India v. Pakistan), Judgment, I.C.J. Reports 1972, p. 56). It adds that ��touching upon� questions relating to the merits is one thing; settling all of them after a preliminary and inevitably summary examination is another�. Nicaragua concludes that if the Court does not reject the objection put forward by Colombia, �it should join that objection to the merits, as none of the questions raised has an exclusively preliminary character�. 47. Colombia disagrees with Nicaragua�s arguments, observing that Article 79, paragraph 1, of the Rules includes, in addition to objections to the Court�s jurisdiction or to admissibility, any �other objection the decision upon which is requested before any further proceedings on the merits�. It contends that in revising its Rules in 1972, the Court �expanded the definition of preliminary objections�. Colombia notes, in this connection, that in the Lockerbie cases (Questions of Interpretation and Application of the 1971 Montreal Convention arising from the Aerial Incident at Lockerbie (Libyan Arab Jamahiriya v. United States of America), Preliminary Objections, Judgment, I.C.J. Reports 1998, pp. 131 et seq., paras. 46 et seq. ; Questions of Interpretation and Application of the 1971 Montreal Convention arising from the Aerial Incident at Lockerbie (Libyan Arab Jamahiriya v. United Kingdom), Preliminary Objections, Judgment, I.C.J. Reports 1998, pp. 26 et seq., paras. 47 et seq.) and a number of earlier cases, the Court made clear that the field of application ratione materiae of Article 79 was no longer limited to objections to jurisdiction or admissibility, but that it covers any objection the purpose of which is �to prevent, in limine, any consideration of the case on the merits�. In answer to Nicaragua�s contention that the Parties are precluded at this stage from touching upon issues that might have to be dealt with on the merits, Colombia notes that �[p]reliminary objections cannot be ⎯ and in practice never are ⎯ argued in a void, removed from all factual context. And that factual context may well touch on issues the full exposition of which will come later when ⎯ and if ⎯ the merits phase is reached.� Colombia contends that the Court can and must determine, at the preliminary objections stage, whether the 1928 Treaty and 1930 Protocol settled the dispute between the Parties and asserts that this is explicitly prescribed in Article XXXIII of the Pact of Bogota which stipulates that, if the parties fail to agree as to whether the Court has jurisdiction, the Court shall �first� decide that question. 48. The Court recalls that, under Article 79, paragraph 9, of the Rules of Court, there are three ways in which it may dispose of a preliminary objection: the Court �shall either uphold the objection, reject it, or declare that the objection does not possess, in the circumstances of the case, an exclusively preliminary character�. 49. The Court further recalls that, in the Nuclear Tests cases (albeit in slightly different circumstances), it emphasized that while examining questions of jurisdiction and admissibility, it is entitled, and in some circumstances may be required, to go into other questions which may not be strictly capable of classification as matters of jurisdiction or admissibility but are of such a nature as to require examination before those matters (Nuclear Tests (Australia v. France), Judgment, I.C.J. Reports 1974, p. 259, para. 22; and Nuclear Tests (New Zealand v. France), Judgment, I.C.J. Reports 1974, p. 463, para. 22; see also Northern Cameroons (Cameroon v. United Kingdom), Preliminary Objections, Judgment, I.C.J. Reports 1963, p. 29). 50. The Court believes that it is not in the interest of the good administration of justice for it to limit itself at the present juncture to stating merely that there is a disagreement between the Parties as to whether the 1928 Treaty and 1930 Protocol settled the matters which are the subject of the present controversy within the meaning of Article VI of the Pact of Bogota, leaving every aspect thereof to be resolved on the merits. 51. In principle, a party raising preliminary objections is entitled to have these objections answered at the preliminary stage of the proceedings unless the Court does not have before it all facts necessary to decide the questions raised or if answering the preliminary objection would determine the dispute, or some elements thereof, on the merits. The Court finds itself in neither of these situations in the present case. The determination by the Court of its jurisdiction may touch upon certain aspects of the merits of the case (Certain German Interests in Polish Upper Silesia, Jurisdiction, Judgment No. 6, 1925, P.C.I.J., Series A, No. 6, p. 15). Moreover, the Court has already found that the question of whether the 1928 Treaty and the 1930 Protocol settled the matters in dispute does not constitute the subject-matter of the dispute on the merits. It is rather a preliminary question to be decided in order to ascertain whether the Court has jurisdiction (see paragraph 40 above). 52. In light of the above, the Court is unable to uphold Nicaragua�s contention that it is precluded from addressing Colombia�s first preliminary objection at this stage of the proceedings. Accordingly, the Court will now proceed to examine this objection. 53. The Court will begin by considering the jurisdictional system of the Pact of Bogota. The Preamble to the Pact of Bogota declares that the treaty was concluded �in fulfilment of Article XXIII [now Article XXVII] of the Charter�. Thirteen Member States of the OAS, including Colombia and Nicaragua, are at present States parties to the Pact of Bogota. 57. These provisions indicate that if the Court were to find that the matters referred to it by Nicaragua pursuant to Article XXXI of the Pact of Bogota had previously been settled by one of the methods spelled out in Article VI thereof, it would lack the requisite jurisdiction under the Pact to decide the case. 58. With respect to Article XXXIV of the Pact, the Court recalls that Colombia considers that, in the present case, the Court should declare the dispute �ended� in accordance with that provision since, pursuant to Article VI, it is without jurisdiction. For its part, Nicaragua contends that, under Article XXXVII of the Pact, the Court should follow the procedure set down in its Statute and that such a declaration could not, in any event, be made at the preliminary stage of the proceedings since it would require the Court to examine the merits of the case. 59. With respect to the arguments made relating to Article XXXIV of the Pact, the Court recalls that it must apply Article 1 of its Statute, which states that the Court �shall function in accordance with the provisions of the present Statute�. This approach is also indicated by Article XXXVII of the Pact of Bogota, which stipulates that �[t]he procedure to be followed by the Court shall be that established in the Statute thereof�. In this regard, the Court notes that, at this stage of the proceedings, it is only deciding, under Article 36, paragraph 6, of the Statute, whether or not it has jurisdiction to hear the merits of the case and may not go further. 60. The Court recalls that Colombia asserts that the 1928 Treaty settled the issue of sovereignty over all of the islands, islets and cays in question and that the 1930 Protocol settled the course of the maritime boundary between the Parties. It contends that consequently there is no dispute between the Parties to be resolved by the Court. In Colombia�s view, the Court�s jurisdiction under the Pact of Bogota is excluded pursuant to Article VI thereof which provides that the dispute settlement procedures set out in the Pact �may not be applied to matters already settled by arrangement between the parties . . . or which are governed by agreements or treaties in force on the date of the conclusion of the present Treaty�. 61. For its part, Nicaragua denies that the dispute between the Parties was settled by the 1928 Treaty and 1930 Protocol. Nicaragua argues first that the 1928 Treaty is not valid and that, even if the Treaty were valid, it was terminated as a result of a material breach by Colombia. Secondly, Nicaragua contends that the 1928 Treaty does not indicate which islands, islets, cays and reefs form part of the San Andres Archipelago and does not cover all the maritime features in dispute such as Roncador, Quitasue�o and Serrana and other maritime features claimed by the Parties which do not form part of the San Andres Archipelago. Finally, Nicaragua rejects Colombia�s assertion that the 1930 Protocol effected a maritime delimitation between the Parties. Nicaragua submits that it remains necessary for the Court to settle all the above questions. 62. The Court will briefly recall the factual background of the conclusion of the 1928 Treaty and the signature of the 1930 Protocol. 63. The 1928 Treaty was signed by Nicaragua and Colombia on 24 March 1928. The Protocol of Exchange of Ratifications was signed on 5 May 1930. The Treaty and Protocol were promulgated in Colombia by Decree No. 993 of 23 June 1930, published in its Diario Oficial, and they were published in Nicaragua�s Diario Oficial on 2 July 1930. 64. After the signature of the 1928 Treaty, Nicaragua proposed the addition to the Treaty of a statement to the effect that the Archipelago of San Andres, sovereignty over which was attributed to Colombia in Article I of the Treaty, did not �extend West of the 82 Greenwich meridian�. Colombia agreed to the inclusion of the foregoing statement in the Protocol of Ratification and informed Nicaragua that the addition of the statement did not require the resubmission of the Treaty to its Congress. 65. The 1928 Treaty consists of a preamble and two articles. In the preamble to the Treaty, Colombia and Nicaragua express their desire to put �an end to the territorial dispute pending between them�. The substantive provisions of the Treaty are set down in Article I thereof; Article II deals with matters relating to the signature and ratification of the Treaty. 66. In the first paragraph of Article I of the Treaty, Colombia recognizes Nicaragua�s sovereignty over the Mosquito Coast between Cape Gracias a Dios and the San Juan River, as well as over the Mangle Grande (Great Corn) and Mangle Chico (Little Corn) Islands in the Atlantic Ocean. In that same paragraph, Nicaragua recognizes Colombia�s sovereignty over the islands of San Andres, Providencia, Santa Catalina, and the other islands, islets and cays that form part of the Archipelago of San Andres. 67. The second paragraph of Article I provides that the Treaty does not apply to Roncador, Quitasue�o and Serrana, �sovereignty over which is in dispute between Colombia and the United States of America�. 68. The first paragraph of the 1930 Protocol states that the 1928 Treaty was designed to put �an end to the question pending between both republics, concerning the San Andres and Providencia Archipelago and the Nicaraguan Mosquito Coast�. The second paragraph of the Protocol provides that �the San Andres and Providencia Archipelago mentioned in the first article of the said Treaty does not extend west of the 82nd degree of longitude west of Greenwich�. �According to the verbal discussions I have had the honour to hold with Your Excellency regarding the advisability of reaching a fair and decorous solution for Colombia and Nicaragua to the controversy that they may have been having regarding the territorial sovereignty of the Mosquitia Coast, the Mangle Islands [Corn Islands] and the Archipelago of San Andres and Providencia, and the possibility of finding that solution in a direct and friendly settlement in which each Party desists from its extreme claims; and by virtue of Your Excellency�s suggestion that the Legation summarise its views on this matter in a Draft treaty, I have pleasure in enclosing that Draft with this note, in . . . which Colombia renounces in favour of Nicaragua the rights of dominion which it claims over the Mosquitia Coast, between the San Juan river and Cabo Gracias a Dios, and over the Mangle Islands, that is Great Corn island and Little Corn island; and Nicaragua, in turn, renounces in favour of Colombia, also absolutely and unconditionally, the rights it aspires to over the islands of San Andres, Providencia and Santa Catalina and the other islands, islets and cays which form the Archipelago. 70. The Senate and Chamber of Representatives of Colombia approved the 1928 Treaty by means of Law 93 of 17 November 1928. The preamble of that Law describes the Treaty as reflecting Colombia�s and Nicaragua�s �desire of putting an end to the territorial dispute pending between them�. In addressing the concessions Colombia gained under the Treaty, the preamble points out that the Treaty �definitely consolidates the status of the Republic in the Archipelago of San Andres and Providencia, erasing any pretensions to the contrary, and recognizes our country�s perpetual sovereignty and right to full domain of that important section of the Republic�. It declares this arrangement to be �necessary and opportune� because of Nicaragua�s pretensions to the Archipelago, which at times reached the point of obstructing Colombia�s administrative activities there. As noted above, Colombia considered that the insertion into the 1930 Protocol of the statement that the Archipelago of San Andres did not extend west of the 82nd degree of longitude west of Greenwich did not require the resubmission of the Treaty to its Congress (see paragraph 64). �the Treaty puts an end to the question pending between both Republics regarding the Archipelago of San Andres and the Nicaraguan Mosquitia; understanding that the Archipelago of San Andres mentioned in the first clause of the Treaty, does not extend to the west of Greenwich Meridian 82 . . .�. 72. On 5 March 1930, prior to Nicaragua�s ratification of the 1928 Treaty, Nicaragua�s Minister for Foreign Affairs appeared before the Nicaraguan Senate in support of the ratification of this Treaty and noted that, according to the Government of Colombia, the resubmission of the Treaty to the Colombian Congress was not necessary for the purposes of �the clarification that demarcated the dividing line�. The Minister added that the language relating to the meridian to be included in the Protocol of Exchange of Ratifications �does not reform the Treaty, because it only intends to indicate a limit between the archipelagos that had been reason for the dispute and that the Colombian Government had already accepted that explanation by means of his Minister Plenipotentiary�. 73. As the Court has found above, the question whether, on the date of the conclusion of the Pact of Bogota in 1948, the matters raised by Nicaragua were, pursuant to Article VI thereof, �governed by agreements or treaties in force�, namely the 1928 Treaty, is to be decided by the Court at this stage in order to ascertain whether it has jurisdiction (see paragraphs 40 and 51 above). For this purpose, the first point for the Court to consider is whether the treaty, which Colombia alleges to have settled the matters constituting the subject-matter of the dispute, was in force in 1948. 74. As noted above, Colombia contends that the Court lacks jurisdiction by virtue of Article VI to decide this case because the dispute was settled by the 1928 Treaty and 1930 Protocol, which were in force in 1948. However, Nicaragua claims that the 1928 Treaty is invalid or, in the alternative, has been terminated due to a material breach by Colombia. 75. With respect to the validity of the 1928 Treaty, Nicaragua contends that the Treaty is invalid for two reasons. It argues first that the Treaty was �concluded in manifest violation of the Nicaraguan Constitution of 1911 that was in force in 1928�. In this regard, Nicaragua considers that the conclusion of the 1928 Treaty contravened Articles 2 and 3 of its 1911 Constitution which remained in force until 1939. Article 2 stipulated, inter alia, that �treaties may not be reached that oppose the independence and integrity of the nation or that in some way affect her sovereignty . . .�. Article 3 provided that �[p]ublic officials only enjoy those powers expressly granted to them by Law. Any action of theirs that exceeds these [powers] is null.� Its second argument is that at the time the Treaty was concluded, Nicaragua was under military occupation by the United States and was precluded from concluding treaties that ran contrary to the interests of the United States and from rejecting the conclusion of treaties that the United States demanded it to conclude. Nicaragua submits that Colombia was aware of this situation and �took advantage of the US occupation of Nicaragua to extort from her the conclusion of the 1928 Treaty�. Nicaragua claims that it remained under the influence of the United States even after the withdrawal of the last United States troops at the beginning of 1933. 76. Colombia maintains that Nicaragua�s assertion relating to the invalidity of the 1928 Treaty is unfounded. Colombia observes that, even assuming that the 1928 Treaty was incompatible with Nicaragua�s 1911 Constitution or that Nicaragua lacked competence to freely conclude treaties due to occupation by the United States, these claims were not raised during the ratification process in the Nicaraguan Congress in 1930, nor for some 50 years thereafter. It points out that, in fact, these arguments were raised for the first time in 1980. Colombia further notes that in 1948, when the Pact of Bogota was concluded, Nicaragua made no reservation with regard to the 1928 Treaty, despite the fact that Nicaragua knew that it had the right to make such a reservation and made a reservation with regard to the validity of an arbitral award. Finally, Colombia contends that, as a consequence, Nicaragua is now precluded from raising the question of the validity of the 1928 Treaty and its 1930 Protocol. In this regard, Colombia relies on the case concerning the Arbitral Award Made by the King of Spain on 23 December 1906 (Honduras v. Nicaragua) in which the Court ruled that Nicaragua�s failure to question the validity of the Arbitral Award for six years after the terms of the Award had become known to it precluded Nicaragua from relying subsequently on allegations of invalidity (Judgment, I.C.J. Reports 1960, pp. 213-214). 77. The Court recalls that Article VI of the Pact of Bogota excludes from the application of all the procedures provided for in the Pact �matters already settled by arrangement between the parties, or by arbitral award or by decision of an international court, or which are governed by agreements or treaties in force on the date of the conclusion of the present Treaty�. What matters are or are not settled within the terms of Article VI may require determination. However, the clear purpose of this provision was to preclude the possibility of using those procedures, and in particular judicial remedies, in order to reopen such matters as were settled between the parties to the Pact, because they had been the object of an international judicial decision or a treaty. When ratifying the Pact, States envisaged bringing within its procedures matters not yet so settled. 78. States parties to the Pact of Bogota would have considered that matters settled by a treaty or international judicial decision had been definitively resolved unless a specific reservation relating thereto was made under Articles LIV and LV of the Pact. Nicaragua did not enter any reservation regarding the 1928 Treaty when it became a party to the Pact of Bogota, the treaty it now invokes as a basis of jurisdiction, although it did enter a reservation with regard to arbitral decisions the validity of which it contested. The Court notes that there is no evidence that the States parties to the Pact of Bogota of 1948, including Nicaragua, considered the 1928 Treaty to be invalid. On 25 May 1932, Nicaragua registered the Treaty and Protocol with the League of Nations as a binding agreement, pursuant to Article 18 of the Covenant of the League, Colombia having already registered the Treaty on 16 August 1930. 79. The Court recalls that Nicaragua advanced �the nullity and lack of validity� of the 1928 Treaty for the first time in an official declaration and White Paper published on 4 February 1980 (see paragraph 28 above). The Court thus notes that, for more than 50 years, Nicaragua has treated the 1928 Treaty as valid and never contended that it was not bound by the Treaty, even after the withdrawal of the last United States troops at the beginning of 1933. At no time in those 50 years, even after it became a Member of the United Nations in 1945 and even after it joined the Organization of American States in 1948, did Nicaragua contend that the Treaty was invalid for whatever reason, including that it had been concluded in violation of its Constitution or under foreign coercion. On the contrary, Nicaragua has, in significant ways, acted as if the 1928 Treaty was valid. Thus, in 1969, when Nicaragua responded to Colombia�s claim that the 82nd meridian, referred to in the 1930 Protocol, constituted the maritime boundary between the two States, Nicaragua did not invoke the invalidity of the Treaty but argued instead that the 1928 Treaty and 1930 Protocol did not effect a maritime delimitation. Similarly, in 1971 when Nicaragua made representations to the United States reserving its rights over Roncador, Quitasue�o and Serrana, it did not call into question the validity of the 1928 Treaty. 80. The Court thus finds that Nicaragua cannot today be heard to assert that the 1928 Treaty was not in force in 1948. 81. In light of all the foregoing, the Court finds that the 1928 Treaty was valid and in force on the date of the conclusion of the Pact of Bogota in 1948, the date by reference to which the Court must decide on the applicability of the provisions of Article VI of the Pact of Bogota setting out an exception to the Court�s jurisdiction under Article XXXI thereof. 82. The Court recalls that Nicaragua argues that, even if the 1928 Treaty was valid, it has been terminated due to Colombia�s interpretation of the Treaty in 1969, which Nicaragua characterized as a material breach thereof. This contention is denied by Colombia. The Court considers that the question whether the Treaty was terminated in 1969 is not relevant to the question of its jurisdiction since what is determinative, under Article VI of the Pact of Bogota, is whether the 1928 Treaty was in force on the date of the conclusion of the Pact, i.e. in 1948, and not in 1969. Accordingly, there is no need for the Court to address the question of the purported termination of the 1928 Treaty in 1969 for the purposes of the ascertainment of its jurisdiction (see paragraph 89 below). 83. Having established that the 1928 Treaty was in force in 1948, the Court will now turn to the question whether the Treaty and its 1930 Protocol settled the matters in dispute between the Parties and consequently whether the Court has jurisdiction in the case under Article XXXI of the Pact. The Court recalls that it has concluded above that there are two questions in dispute between the Parties on the merits: first, territorial sovereignty over islands and other maritime features and, second, the course of the maritime boundary between the Parties (see paragraph 42). 84. The Court notes that the Parties disagree about whether various matters relating to territorial sovereignty were settled by the 1928 Treaty, namely sovereignty over the three islands of the San Andres Archipelago expressly named in the Treaty, the scope and composition of the rest of the San Andres Archipelago and sovereignty over Roncador, Quitasue�o and Serrana. The Parties also disagree about whether the 1930 Protocol effected a maritime delimitation between them. 85. The Court finds it appropriate to examine in turn whether each matter listed above has been settled by the 1928 Treaty and 1930 Protocol. In this regard, the Court recalls that it and its predecessor have already considered the well-foundedness of a preliminary objection in relation to different elements of the dispute, taken separately (see Ahmadou Sadio Diallo (Republic of Guinea v. Democratic Republic of the Congo), Preliminary Objections, Judgment of 24 May 2007, paras. 31-33 and para. 98; Oil Platforms (Islamic Republic of Iran v. United States of America), Preliminary Objection, Judgment, I.C.J. Reports 1996 (II), p. 810, para. 17, and p. 821, para. 55; Electricity Company of Sofia and Bulgaria (Belgium v. Bulgaria), Judgment, 1939, P.C.I.J., Series A/B, No. 77, pp. 76-77 and 84). 86. The Court will begin by examining whether the 1928 Treaty settled the question of sovereignty over the three islands of the San Andres Archipelago expressly named in the first paragraph of Article I of the 1928 Treaty. That paragraph states, inter alia, that: �[t]he Republic of Nicaragua recognises the full and entire sovereignty of the Republic of Colombia over the islands of San Andres, Providencia, Santa Catalina and over the other islands, islets and reefs forming part of the San Andres Archipelago�. 87. In Colombia�s view, Article I of the 1928 Treaty clearly establishes that it has sovereignty over the islands of San Andres, Providencia and Santa Catalina. For its part, Nicaragua acknowledges that Article I of the 1928 Treaty stipulates that Colombia has sovereignty over the Archipelago of San Andres and recognizes that the Archipelago includes the three named islands. However, it contends that the Treaty is invalid or has been terminated and that therefore Article I has no legal value. 88. The Court considers that it is clear on the face of the text of Article I that the matter of sovereignty over the islands of San Andres, Providencia and Santa Catalina has been settled by the 1928 Treaty within the meaning of Article VI of the Pact of Bogota. In the Court�s view there is no need to go further into the interpretation of the Treaty to reach that conclusion and there is nothing relating to this issue that could be ascertained only on the merits. 89. Nicaragua�s contention that the 1928 Treaty is invalid, has been dealt with by the Court in paragraphs 79 to 81 above. With regard to Nicaragua�s further assertion that the 1928 Treaty has been terminated by material breach due to the interpretation adopted by Colombia from 1969 onwards, as the Court stated in paragraph 82 above, that issue will not be addressed by the Court at this stage since it is not relevant to the question of its jurisdiction by reference to Article VI of the Pact of Bogota. Even if the Court were to find that the 1928 Treaty has been terminated, as claimed by Nicaragua, this would not affect the sovereignty of Colombia over the islands of San Andres, Providencia and Santa Catalina. The Court recalls that it is a principle of international law that a territorial r�gime established by treaty �achieves a permanence which the treaty itself does not necessarily enjoy� and the continued existence of that r�gime is not dependent upon the continuing life of the treaty under which the r�gime is agreed (Territorial Dispute (Libyan Arab Jamahiriya/Chad), Judgment, I.C.J. Reports 1994, p. 37, paras. 72-73). 90. In the light of the foregoing, the Court finds that it can dispose of the issue of the three islands of the San Andres Archipelago expressly named in the first paragraph of Article I of the 1928 Treaty at the current stage of the proceedings. That matter has been settled by the Treaty. Consequently, Article VI of the Pact is applicable on this point and therefore the Court does not have jurisdiction under Article XXXI of the Pact of Bogota over the question of sovereignty over the three named islands. Accordingly, the Court upholds the first preliminary objection raised by Colombia in so far as it concerns the Court�s jurisdiction as regards the question of sovereignty over the islands of San Andres, Providencia and Santa Catalina. 91. The Court now turns to examine whether the 1928 Treaty settled, within the meaning of Article VI of the Pact of Bogota, the question of sovereignty over the maritime features which are not expressly mentioned in the first paragraph of Article I of the 1928 Treaty. 92. Colombia contends that geographically and historically the Archipelago of San Andres was �understood as comprising the string of islands, cays, islets and banks stretching from Albuquerque in the south to Serranilla and Bajo Nuevo in the north -- including the Islas Mangles (Corn Islands) -- and the appurtenant maritime areas�. Colombia points out that, under the terms of Article I of the Treaty, Nicaragua recognizes Colombia�s sovereignty not only over San Andres, Providencia and Santa Catalina but also over �all the other islands, islets and cays that form part of the . . . Archipelago of San Andres�. Colombia also observes that Article I of the Treaty provided that Nicaragua has sovereignty over the Corn Islands and notes that consequently the Archipelago of San Andres as defined from 1928 onwards did not include those islands. 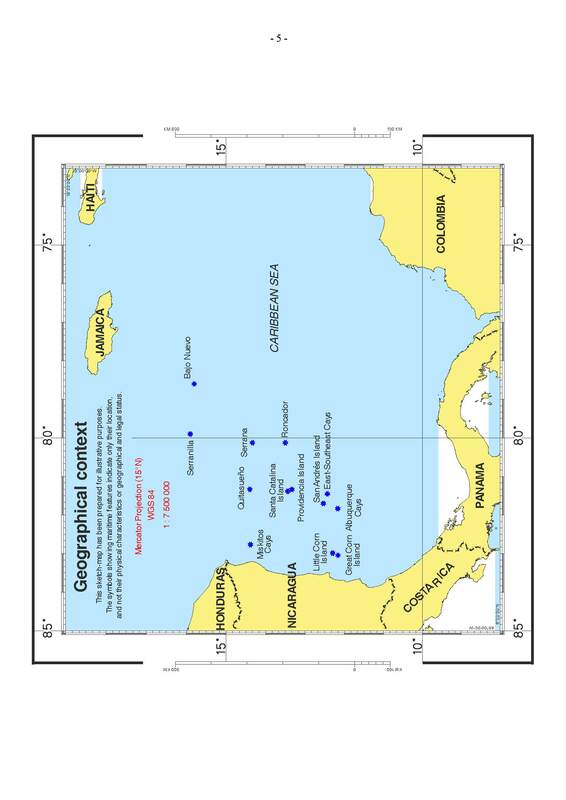 �the Cays of Roncador (including Dry Rocks), Quitasue�o, Serrana (including North Cay, Little Cay, Narrow Cay, South Cay, East Cay and Southwest Cay), Serranilla (including Beacon Cay, East Cay, Middle Cay, West Breaker and Northeast Breaker), Bajo Nuevo (including Bajo Nuevo Cay, East Reef and West Reef), Albuquerque (including North Cay, South Cay and Dry Rock), and the group of Cays of the East-Southeast . . . (including Bolivar Cay or Middle Cay, West Cay, Sand Cay and East Cay), as well as by other adjacent islets, cays, banks and atolls�. In support of its claims, Colombia refers to an inset on an official map of Colombia from 1931, showing the Archipelago of San Andres and Providencia as including the islands of San Andres, Providencia and Santa Catalina as well as the Roncador, Quitasue�o, Serrana, Serranilla, Bajo Nuevo, Albuquerque and East-Southeast Cays. Colombia notes that Nicaragua did not protest against that map. 94. Nicaragua observes that, while Article I of the 1928 Treaty stipulates that San Andres, Providencia and Santa Catalina form part of the San Andres Archipelago, it does not define which �other islets and reefs� are included in the Archipelago. Nicaragua notes that, according to the 1930 Protocol, the Archipelago does not extend west of the 82nd meridian. It points out, however, that the Treaty does not give any indication as to the northern or southern limits of the Archipelago. Nicaragua submits that the Archipelago of San Andres �only includes the islands of San Andres and Providencia and adjacent islets and cays, but does not include, among others, the features of Serrana, Roncador, Quitasue�o, Serranilla and Bajo Nuevo�. 95. Nicaragua contends that the claims made by Colombia to maritime features, other than San Andres, Providencia and Santa Catalina relate to �a few groups of very small islands, without any connection, lying hundreds of kilometres apart� and that, geographically and geomorphologically, these features are separate and do not form a single unit. Nicaragua claims that, according to the practice prevailing when the 1928 Treaty was concluded, these features did not form an archipelago in legal terms either. With reference to the 1931 map relied upon by Colombia, Nicaragua notes that the map does not indicate precisely which features are included in the Archipelago of San Andres and Providencia. 96. The Court recalls that there is agreement between the Parties that the San Andres Archipelago includes the islands of San Andres, Providencia and Santa Catalina as well as adjacent islets and cays. However, the Parties disagree as to which maritime features other than those named islands form part of the Archipelago. 97. The Court considers that it is clear on the face of the text of the first paragraph of Article I of the 1928 Treaty that its terms do not provide the answer to the question as to which maritime features apart from the islands of San Andres, Providencia and Santa Catalina form part of the San Andres Archipelago over which Colombia has sovereignty. That being so, this matter has not been settled within the meaning of Article VI of the Pact of Bogota and the Court has jurisdiction under Article XXXI of the Pact of Bogota. Therefore, the Court cannot uphold the first preliminary objection raised by Colombia in so far as it concerns the Court�s jurisdiction as regards the question of sovereignty over the maritime features forming part of the San Andres Archipelago, save for the islands of San Andres, Providencia and Santa Catalina. 98. The next question for the Court to answer is whether the issue of sovereignty over Roncador, Quitasue�o and Serrana has been settled by the 1928 Treaty within the meaning of Article VI of the Pact of Bogota. The second paragraph of Article I of the 1928 Treaty states that �[t]he present Treaty does not apply to the reefs of Roncador, Quitasue�o and Serrana, sovereignty over which is in dispute between Colombia and the United States of America�. 99. Colombia notes that the 1928 Treaty provided that it did not apply to Roncador, Quitasue�o and Serrana because they were in dispute between itself and the United States. It contends that those three maritime features form part of the San Andres Archipelago and submits that the second paragraph of Article I was included in the Treaty precisely for that reason. In Colombia�s view, that provision is only explicable on the basis that it was necessary to put Roncador, Quitasue�o and Serrana outside of the reach of the recognition of Colombian sovereignty over the San Andres Archipelago contained in the first paragraph of Article I. 100. Colombia submits that by agreeing to the inclusion of the second paragraph of Article I of the 1928 Treaty, Nicaragua recognized that it did not have any claim to sovereignty over Roncador, Quitasue�o and Serrana and that the only possible �claimants� were Colombia or the United States. Colombia notes that there is no mention in the second paragraph of Article I of any dispute over Roncador, Quitasue�o and Serrana involving a Nicaraguan claim or right and it considers that it is not conceivable that, had Nicaragua had any claim to those three maritime features, it would have refrained from at least mentioning it during the negotiation of the 1928 Treaty. It further points out that Nicaragua did not assert a claim of sovereignty over Roncador, Quitasue�o and Serrana until 1971 when Colombia and the United States began negotiating a treaty regarding those three features. Colombia submits that the result of the renunciation by the United States of its claims to Roncador, Quitasue�o and Serrana in the 1972 Vasquez-Saccio Treaty (see paragraph 25 above) was that Colombia had sovereignty over those three maritime features and thus over the whole of the San Andres Archipelago. 101. Nicaragua contends that, even if the 1928 Treaty is valid and in force, it did not settle the dispute between Colombia and Nicaragua concerning sovereignty over Roncador, Quitasue�o and Serrana since the matter was expressly excluded from the scope of that Treaty. Nicaragua disputes Colombia�s claim that the San Andres Archipelago or the definition of the San Andres Archipelago in the 1928 Treaty includes Roncador, Quitasue�o and Serrana. It submits that, historically, the Archipelago was not considered to include those three features and notes that they are situated at a great distance from the islands mentioned by name in Article I of the 1928 Treaty. Nicaragua argues that the fact that the 1928 Treaty mentions Roncador, Quitasue�o and Serrana does not mean that those features are part of the San Andres Archipelago since the 1928 Treaty deals generally with �territorial questions� between Colombia and Nicaragua and not just the San Andres Archipelago. 102. Nicaragua denies that it relinquished its claim to sovereignty over Roncador, Quitasue�o and Serrana by agreeing to the inclusion of the second paragraph of Article I in the text of the 1928 Treaty. It notes that, if the intention had been for Nicaragua to renounce its claim, this could have been stated in a much more explicit manner. Nicaragua adds that it reserved its rights over Roncador, Quitasue�o and Serrana in 1971 during the negotiation of the Vasquez-Saccio Treaty and recalls that, following the signing of the Treaty, its National Assembly passed a formal declaration of sovereignty over Roncador, Quitasue�o and Serrana and the Government made a formal protest to the Governments of Colombia and the United States (see paragraphs 24 and 27 above). 103. Nicaragua also denies that the 1972 Vasquez-Saccio Treaty constituted an acknowledgment of Colombian sovereignty by the United States. Nicaragua contends that, in relinquishing its rights over Roncador, Quitasue�o and Serrana, the United States did not acknowledge Colombia�s rights thereover. In this regard, Nicaragua contends that, as stated in the Senate Foreign Relations Committee and in a 1981 aide-memoire presented by the United States to Nicaragua, the United States considered that the 1972 Treaty was without prejudice to Nicaragua�s claim to sovereignty over Roncador, Quitasue�o and Serrana and did not intend to take any position regarding the merits of the competing claims of Colombia and Nicaragua. 104. The Court observes that the meaning of the second paragraph of Article I of the 1928 Treaty is clear: this treaty does not apply to the three maritime features in question. Therefore, the limitations contained in Article VI of the Pact of Bogota do not apply to the question of sovereignty over Roncador, Quitasue�o and Serrana. The Court thus has jurisdiction over this issue under Article XXXI of the Pact of Bogota and cannot uphold the first preliminary objection raised by Colombia in so far as it concerns the Court�s jurisdiction as regards the question of sovereignty over Roncador, Quitasue�o and Serrana. 105. The Court turns to address the question whether the 1928 Treaty and 1930 Protocol settled the question of the maritime delimitation between the Parties within the meaning of Article VI of the Pact of Bogota. 106. Colombia asserts that the Parties had agreed in the 1928 Treaty and 1930 Protocol upon the 82nd meridian as the delimitation line of the maritime areas between them and that, consequently, the delimitation issue must be considered to have been settled. To support this contention, Colombia points to the language of the Protocol, in which the Parties declare �that the San Andres and Providencia Archipelago mentioned in the first article of the said Treaty does not extend west of the 82nd degree of longitude west of Greenwich�. 107. Colombia submits that the drafting history of the 1930 Protocol shows that the Parties regarded the 82nd meridian as �a limit, as a dividing line, as a line separating whatever Colombian or Nicaraguan jurisdictions or claims there then existed or might exist in the future�. It asserts that the debates in the Nicaraguan Senate show that the provision regarding the 82nd meridian was intended to define the maritime boundary between the two States in order to put an end, once and for all, to the entire dispute, both territorial and maritime, between them. In this regard, Colombia points to certain statements during the debates in the Senate, including that the �demarcation of the dividing line of the waters in dispute . . . is indispensable for the question to be at once terminated forever� and a statement of the Nicaraguan Minister for Foreign Affairs that the Senate Commission on Foreign Affairs and the advisers of the Government had agreed �to accept the 82� west Greenwich meridian . . . as the boundary in this dispute with Colombia�. 109. Colombia also points out that the 82nd meridian has been depicted on its maps since 1931 as the maritime boundary between Colombia and Nicaragua, and that Nicaragua never lodged any protest against those maps. Colombia also maintains, contrary to Nicaragua�s contention, that no subsequent maritime boundary negotiations had taken place between it and Nicaragua, and that the delimitation issue was deemed to have been �settled� by the Treaty and Protocol thereto. 110. Colombia contends further that since the 82nd meridian was conceived as a maritime boundary, it remains valid pursuant to the fundamental principle of the stability of boundaries, regardless of any intervening change in the law of the sea. 111. Nicaragua rejects Colombia�s argument that the reference to the 82nd meridian in the 1930 Protocol sought to effect a general maritime delimitation between Nicaragua and Colombia. It maintains that the Protocol simply fixed the western limit of the San Andres Archipelago at the 82nd meridian. In support of this contention, Nicaragua points to the statement made by Nicaragua�s Minister for Foreign Affairs during the ratification debates in Nicaragua�s Senate, where he stated that the provision concerning the 82nd meridian �does not reform the  Treaty, because it only intends to indicate a limit between the archipelagos that had been the reason for the dispute�. Nicaragua also refers to the language of the decree whereby Nicaragua ratified the Treaty and Protocol �in the understanding that the Archipelago of San Andres mentioned in the first clause of the Treaty does not extend west of Greenwich Meridian 82 . . .�. According to Nicaragua, it is significant that the decree makes no reference at all to maritime delimitation. 112. Nicaragua points out that if the reference in the Protocol to the 82nd meridian had amounted to a maritime delimitation, the provision would have been included in the operative part of the 1928 Treaty, and not in a protocol of exchange of ratifications. Nicaragua emphasizes that the difference in the words used in the preamble of the Treaty and the Protocol did not mean that the Parties had given a maritime dimension to the agreement. It further submits that the reference to the 82nd meridian could not have effected a maritime delimitation since the concepts of continental shelf and exclusive economic zone were at the time still unknown under international law. 113. As for the maps that Colombia asserts have depicted the 82nd meridian, Nicaragua contends that there were no legends or other indications on these maps, identifying the 82nd meridian as a maritime boundary. Nicaragua had no reason, therefore, to protest against these maps. Nicaragua also asserts that it was not informed of Colombia�s maritime claims until 1969, when Colombia protested against Nicaragua�s grants of oil exploration concessions in areas east of the 82nd meridian. Nicaragua notes that it responded to those claims immediately, stating that the objective of the provision referring to the 82nd meridian was �to clearly and specifically establish in a restrictive manner the extension of the Archipelago of San Andres, and by no valid means can it be interpreted as a boundary of Nicaraguan rights or creator of a border between the two countries�. It contends further that negotiations between the Parties in 1977, 1995 and 2001 demonstrate that Colombia did not consider that the maritime delimitation had been finally settled between the two States. Nicaragua emphasizes, in this connection, that these negotiations concerned, inter alia, the delimitation of the respective maritime areas of the Parties. 114. Finally, Nicaragua maintains that since the 1928 Treaty and 1930 Protocol did not settle the maritime dispute between it and Colombia, Article VI of the Pact of Bogota is not applicable to this issue. It claims that the Court must, therefore, reject that aspect of Colombia�s preliminary objection. 115. The Court considers that, contrary to Colombia�s claims, the terms of the Protocol, in their plain and ordinary meaning, cannot be interpreted as effecting a delimitation of the maritime boundary between Colombia and Nicaragua. That language is more consistent with the contention that the provision in the Protocol was intended to fix the western limit of the San Andres Archipelago at the 82nd meridian. 116. In the Court�s view, a careful examination of the pre-ratification discussions of the 1928 Treaty by and between the Parties confirms that neither Party assumed at the time that the Treaty and Protocol were designed to effect a general delimitation of the maritime spaces between Colombia and Nicaragua (see paragraphs 70 to 72 above). Here it is to be noted that Colombia did not find it necessary to resubmit the 1928 Treaty to its Congress for the consideration of the provision inserted into the 1930 Protocol because Colombia�s diplomatic representatives assumed that the reference to the 82nd meridian in the Protocol amounted to an interpretation of the first paragraph of Article I of the Treaty and thus had not changed the substance thereof. It may be added that Nicaragua�s Minister for Foreign Affairs, in his appearance before the Nicaraguan Senate prior to ratification, assured that body that the reference to the 82nd meridian �does not reform the Treaty, because it only intends to indicate a limit between the archipelagos that have been [the] reason for the dispute�. 117. Contrary to Colombia�s assertion, the Court does not consider it significant that in the preamble of the Treaty, the Parties express their desire to put an end to the �territorial dispute pending between them� (emphasis added) whereas in the Protocol they refer �to the dispute between both republics� (emphasis added). In the Court�s view, the difference between the language of the Treaty and that of the Protocol cannot be read to have transformed the territorial nature of the Treaty into one that was also designed to effect a general delimitation of the maritime spaces between the two States. This conclusion is apparent from the full text of the aforementioned phrase in the Protocol, where the Parties state that the 1928 Treaty was concluded �with a view to putting an end to the dispute between both republics concerning the San Andres and Providencia Archipelago and the Nicaraguan Mosquito Coast�. In other words, the �dispute� to which the Protocol refers relates to the Mosquito Coast along with the San Andres Archipelago; it does not refer, even by implication, to a general maritime delimitation. 118. The Court does not share Colombia�s view that its maps, dating back to 1931, which allegedly show the 82nd meridian as the boundary dividing the maritime spaces between Nicaragua and Colombia, demonstrate that both Parties believed that the Treaty and Protocol had effected a general delimitation of their maritime boundary. An examination of these maps indicates that the dividing lines on them are drawn in such a way along the 82nd meridian between the San Andres Archipelago and Nicaragua that they could be read either as identifying a general maritime delimitation between the two States or as only a limit between the archipelagos. Given the ambiguous nature of the dividing lines and the fact that these maps contain no explanatory legend, they cannot be deemed to prove that both Colombia and Nicaragua believed that the Treaty and Protocol had effected a general delimitation of their maritime spaces. Nicaragua�s failure to protest the maps does not therefore imply an acceptance of the 82nd meridian as the maritime boundary. 119. Finally, with respect to Nicaragua�s claim that the negotiations between the two States in 1977, 1995 and 2001 dealt with the delimitation of their respective maritime spaces, the Court finds that the material presented to it by the Parties on this subject is inconclusive and does not allow it to evaluate the significance of the meetings held in 1977, 1995 and 2001 for the question of whether the Parties considered that the 1928 Treaty and 1930 Protocol had effected a maritime delimitation between them. 120. Consequently, after examining the arguments presented by the Parties and the material submitted to it, the Court concludes that the 1928 Treaty and 1930 Protocol did not effect a general delimitation of the maritime boundary between Colombia and Nicaragua. It is therefore not necessary for the Court to consider the arguments advanced by the Parties regarding the effect on this question of changes in the law of the sea since 1930. Since the dispute concerning maritime delimitation has not been settled by the 1928 Treaty and 1930 Protocol within the meaning of Article VI of the Pact of Bogota, the Court has jurisdiction under Article XXXI of the Pact. Therefore, the Court cannot uphold Colombia�s first preliminary objection in so far as it concerns the Court�s jurisdiction as regards the question of the maritime delimitation between the Parties. 121. In addition to Article XXXI of the Pact of Bogota, Nicaragua invoked as a basis of the Court�s jurisdiction the declarations made by the Parties under Article 36 of the Statute of the Permanent Court of International Justice, which are deemed, for the period for which they still have to run, to be acceptances of the compulsory jurisdiction of the present Court pursuant to Article 36, paragraph 5, of its Statute (see paragraph 1 above). In its second preliminary objection, Colombia asserts that the Court has no jurisdiction on this basis. �The Republic of Colombia recognizes as compulsory, ipso facto and without special agreement, on condition of reciprocity, in relation to any other State accepting the same obligation, the jurisdiction of the Permanent Court of International Justice in accordance with Article 36 of the Statute. The Court notes that, under Article 36, paragraph 5, of its Statute, the declarations made by both Parties are deemed to be acceptances of its compulsory jurisdiction for the period which they still had to run and in accordance with their terms. On 23 October 2001, Nicaragua made a reservation to its declaration which does not, however, have any relevance to the present case. On 5 December 2001, Colombia notified the Secretary-General of the termination of its optional clause declaration. �the commitment in Article XXXI . . . is an autonomous commitment, independent of any other which the parties may have undertaken or may undertake by depositing with the United Nations Secretary-General a declaration of acceptance of compulsory jurisdiction under Article 36, paragraphs 2 and 4, of the Statute� (Border and Transborder Armed Actions (Nicaragua v. Honduras), Jurisdiction and Admissibility, Judgment, I.C.J. Reports 1988, p. 82, para. 27, and p. 85, para. 36). 124. Colombia considers that the Court thus laid down the principle of the primacy of the title of jurisdiction under the Pact of Bogota. It concludes that, when an Applicant invokes both the Pact of Bogota and optional clause declarations, it is the Pact of Bogota, as lex specialis, which governs or, in other words, is determinative and conclusive. 125. Colombia claims that in the Armed Actions case, the Court held that the title of jurisdiction under the Pact of Bogota prevailed over subsequent optional clause declarations. Colombia points out that, in the present case, the argument that the Pact of Bogota takes precedence is even stronger since the optional clause declarations of Nicaragua and Colombia were made before the entry into force of the Pact of Bogota. Therefore, the Pact of Bogota is not only lex specialis but also lex posterior. 126. In Colombia�s view, �it is the Pact of Bogota which constitutes the Court�s title of jurisdiction in our case� and were the Court to conclude that it had no jurisdiction to adjudicate upon the present dispute, the application of the Pact would require the Court to declare the controversy ended pursuant to Article XXXIV thereof, �not only for the purposes of the Court�s jurisdiction under the Pact, but for all purposes�. In this regard, Colombia claims that a dispute cannot be settled and ended and yet at the same time be a dispute capable of adjudication by the Court pursuant to jurisdiction accorded under the optional clause. Consequently, once the controversy between the Parties has been declared by the Court to be ended under the Pact of Bogota, there would be no controversy outstanding to which jurisdiction could attach under any other title, including the declarations of the Parties under the optional clause. 127. Colombia argues that, in any event, the Court would have no jurisdiction on this basis since Colombia�s optional clause declaration had been withdrawn by the date of the filing of Nicaragua�s Application. Colombia further contends that even if its declaration were found to be in force at the time when Nicaragua filed its Application, the alleged dispute would fall outside the scope of the declaration as a result of a reservation which excluded disputes arising out of facts prior to 6 January 1932. According to Colombia, the facts which have given rise to the dispute between Nicaragua and Colombia, namely the conclusion of the 1928 Treaty and 1930 Protocol, predate 6 January 1932. 128. Nicaragua submits that although the Court stated in its Judgment in the Armed Actions case that �in relations between the States parties to the Pact of Bogota, that Pact is governing�, this cannot �destroy the value of the Optional Clause declarations as an independent basis of jurisdiction� since they �have an intrinsic value in and of themselves, and their operation is not predetermined by other titles of jurisdiction�. It considers that the primacy of the Pact does not signify exclusiveness. Nicaragua contends that this was recognized by the Court itself in the Armed Actions case when it stated that the commitment under the Pact of Bogota is �independent of any other which the parties may have undertaken . . . by depositing . . . a declaration of acceptance of compulsory jurisdiction� (emphasis added). It points out that in the Armed Actions case, the Court did not rule out the possibility that it also had jurisdiction under the Parties� optional clause declarations but simply concluded that it �[did] not need to consider� that question since it had already found that it had jurisdiction under the Pact of Bogota. 129. In Nicaragua�s view, if the Court were to declare the controversy ended pursuant to Article XXXIV of the Pact, that finding would have to be understood within the framework of the Pact itself. Thus the controversy would be ended only to the extent that it would no longer be possible to invoke the Pact as a basis of jurisdiction. It underlines that such a finding pursuant to Article XXXIV of the Pact does not exclude the existence of other bases of jurisdiction such as the declarations by the Parties under the optional clause. These declarations �operate independently of any bases of jurisdiction that may be established by means of treaties; they are not subordinate to them�. 130. Nicaragua argues that the two bases of jurisdiction, namely Article XXXI of the Pact of Bogota and the declarations made by the Parties under the optional clause are complementary and that it is for the Court to decide whether to rely upon only one of them or to combine them. It points out that the States parties to the Pact of Bogota intended to broaden the jurisdiction of the Court not to limit existing obligations deriving from other instruments. In this context, Nicaragua refers to the statement of the Permanent Court of International Justice in the Electricity of Sofia and Bulgaria case regarding multiple agreements accepting compulsory jurisdiction. 131. Nicaragua denies that Colombia�s declaration was not in force at the time of the filing of the Application. It contends that reasonable notice is required for the withdrawal of declarations and that this condition was not complied with by Colombia. Nicaragua does not dispute that Colombia�s declaration applied only to disputes arising from facts subsequent to 6 January 1932; it argues, however, that the generating fact of the present dispute, namely the interpretation of the 1928 Treaty and 1930 Protocol adopted by Colombia from 1969 onwards, arose after 6 January 1932. Finally, Nicaragua asserts, referring to the provisions of Article 79, paragraph 9, of the Rules of Court, that in any event the objection submitted by Colombia does not have an exclusively preliminary character (see paragraph 13 above). 132. The Court notes initially that the question of whether the declarations made by the Parties under the optional clause can provide a distinct and sufficient basis of jurisdiction in the present case, as submitted by Nicaragua, now only arises in respect of that part of the dispute relating to the sovereignty over the three islands expressly named in Article I of the 1928 Treaty: San Andres, Providencia and Santa Catalina. Having first examined the preliminary objection raised by Colombia to jurisdiction under the Pact of Bogota, the Court has concluded above(paragraphs 97, 104 and 120) that it has jurisdiction on the basis of Article XXXI of the Pact to deal with all the other aspects of the dispute. Consequently, no purpose is served by examining whether, in relation to those aspects, the declarations of the Parties under the optional clause could also provide a basis of the Court�s jurisdiction (see Border and Transborder Armed Actions (Nicaragua v. Honduras), Jurisdiction and Admissibility, Judgment, I.C.J. Reports 1988, p. 90, para. 48). 133. The Court recalls that in the Armed Actions case it stated that �[s]ince, in relations between the States parties to the Pact of Bogota, that Pact is governing, the Court will first examine the question whether it has jurisdiction under Article XXXI of the Pact� (ibid., p. 82, para. 27; emphasis added). However, this cannot be interpreted in any way other than that the Court, faced with the two titles of jurisdiction invoked, could not deal with them simultaneously and decided to proceed from the particular to the more general, without thereby implying that the Pact of Bogota prevailed over and excluded the second title of jurisdiction, namely the optional clause declarations. 134. In stating in the Armed Actions Judgment (ibid., p. 85, para. 36) that the commitment under Article XXXI of the Pact is autonomous, the Court was merely responding to and rejecting the arguments by Honduras, first, that Article XXXI requires an optional clause declaration to be made in order for that Article to be in effect and, second, that the conditions of acceptance of compulsory jurisdiction of the Court set forth in such a declaration by way of reservations were determinative of the scope of the commitment under Article XXXI of the Pact of Bogota. In particular, by stating that the commitment under Article XXXI is an autonomous commitment, independent from an optional clause declaration, the Court explained why �the commitment in Article XXXI can only be limited by means of reservations to the Pact itself� (ibid.). �the multiplicity of agreements concluded accepting the compulsory jurisdiction is evidence that the contracting Parties intended to open new ways of access to the Court rather than to close old ways or to allow them to cancel each other out with the ultimate result that no jurisdiction would remain� (Electricity Company of Sofia and Bulgaria (Belgium v. Bulgaria), Judgment, 1939, P.C.I.J., Series A/B, No. 77, p. 76). 136. In the light of the above, the Court considers that the provisions of the Pact of Bogota and the declarations made under the optional clause represent two distinct bases of the Court�s jurisdiction which are not mutually exclusive. 137. The Court notes that the scope of its jurisdiction could be wider under the optional clause than under the Pact of Bogota. The Court observes that neither Colombia nor Nicaragua has made a reservation to their respective optional clause declarations identical or similar to the restriction contained in Article VI of the Pact of Bogota. Accordingly, the limitation imposed by Article VI of the Pact would not be applicable to jurisdiction under the optional clause. 138. The question has arisen as to whether the claim by Nicaragua of sovereignty over the islands of San Andres, Providencia and Santa Catalina in the present case means that there thus is a continuing dispute as to this matter. The Court has upheld the first preliminary objection to jurisdiction, based on the Pact of Bogota, raised by Colombia in so far as it concerns the Court�s jurisdiction regarding the question of sovereignty over these three islands, after satisfying itself that the matter of sovereignty over these islands had been settled by the 1928 Treaty. The Court could not have concluded that it lacked jurisdiction over that matter under the Pact of Bogota had there still been an extant dispute with regard thereto. Moreover, �[w]hether there exists an international dispute is a matter for objective determination� (Interpretation of Peace Treaties with Bulgaria, Hungary and Romania, First Phase, Advisory Opinion, I.C.J. Reports 1950, p. 74). This determination is an integral part of the Court�s judicial function. The Court�s acknowledgment of the fact that sovereignty over the three islands was attributed to Colombia under the 1928 Treaty was made for the purposes of ascertaining whether or not the Court had jurisdiction over the matter under the Pact of Bogota. However, the very fact that the dispute on the question of the sovereignty over the three islands has been settled by the 1928 Treaty is equally relevant for the purposes of determining whether the Court has jurisdiction on the basis of the optional clause declarations. In this regard, the Court notes that Article 36, paragraph 2, of the Statute expressly requires that, in order for the Court to have jurisdiction on the basis of optional clause declarations, there must exist a �legal dispute� between the Parties. Given the Court�s finding that there is no extant legal dispute between the Parties on the question of sovereignty over the islands of San Andres, Providencia and Santa Catalina, the Court cannot have jurisdiction over this question either under the Pact of Bogota or on the basis of the optional clause declarations. 139. In the light of the foregoing, the Court finds that no practical purpose would be served by proceeding further with the other matters raised in the second preliminary objection filed by Colombia, including the examination of Colombia�s contentions that its declaration under the optional clause was terminated with legal effect by the date on which Nicaragua filed its Application or that the present dispute falls outside the scope of Colombia�s declaration due to the effect of its reservation ratione temporis. 140. The Court thus upholds the second preliminary objection relating to jurisdiction under the optional clause declarations raised by Colombia in so far as it concerns the Court�s jurisdiction as regards the question of sovereignty over the islands of San Andres, Providencia and Santa Catalina, and finds that it is not necessary to examine the objection in so far as it concerns sovereignty over the other maritime features in dispute between the Parties and the maritime delimitation between the Parties (see paragraph 132). 141. In accordance with Article 79, paragraph 9, of the Rules of Court, time-limits for the further proceedings shall subsequently be fixed by Order of the Court. Finds that it has jurisdiction, on the basis of Article XXXI of the Pact of Bogota, to adjudicate upon the dispute concerning the maritime delimitation between the Parties. Done in French and in English, the French text being authoritative, at the Peace Palace, The Hague, this thirteenth day of December, two thousand and seven, in three copies, one of which will be placed in the archives of the Court and the others transmitted to the Government of the Republic Nicaragua and the Government of the Republic of Colombia, respectively. Vice-President AL-KHASAWNEH appends a dissenting opinion to the Judgment of the Court; Judge RANJEVA appends a separate opinion to the Judgment of the Court; Judges PARRA-ARANGUREN, SIMMA and TOMKA append declarations to the Judgment of the Court; Judge ABRAHAM appends a separate opinion to the Judgment of the Court; Judge KEITH appends a declaration to the Judgment of the Court; Judge BENNOUNA appends a dissenting opinion to the Judgment of the Court; Judge ad hoc GAJA appends a declaration to the Judgment of the Court. 1. I am unable to concur with the majority view that the 1928 Treaty between Colombia and Nicaragua is valid (Judgment, paragraph 81), nor with the finding, directly flowing from that view, and predicated upon it, that Colombia�s first preliminary objection to jurisdiction is upheld in so far as it concerns sovereignty over the Islands of San Andres, Providencia and Santa Catalina (Judgment, subparagraph (1)(a) of operative paragraph 142). 2. I should, however, hasten to add, before a misunderstanding occurs, that in saying this I do not imply that the Treaty and Protocol in question are necessarily invalid, nor that the Islands referred to above consequently necessarily appertain to Nicaragua. All I say is that I belong to the party of the �don�t knows� who believe that crucial and intricate questions, of the nature encountered in this case, can only be determined definitively after thorough consideration at the merits phase, and not in a summary, unconvincing and premature manner as was the case in the present instance, especially since there was no compelling judicial reason to have done so. 3. I am of course not oblivious to the fact that in order to establish its jurisdiction and to ascertain the limits thereof, the Court may need, on occasion, to touch on the merits to better inform itself of facts that help it achieve that purpose of ascertaining its jurisdiction and which can only be gleaned by looking at the merits. That such recourse to the merits is permissible is beyond doubt. It is necessitated by considerations of common sense and rests on a long chain of precedents. As was rightly observed by Judge Shahabuddeen in a learned separate opinion, �[t]he idea that, in determining preliminary objections, the Court�s enquiry could �touch� on the merits went back to the 1920s� (Oil Platforms (Islamic Republic of Iran v. United States of America), Preliminary Objection, Judgment, I.C.J. Reports 1996 (II), separate opinion of Judge Shahabuddeen, p. 830; see Certain German Interests in Polish Upper Silesia, Jurisdiction, Judgment No. 6, 1925, P.C.I.J., Series A, No. 6, p. 15). 4. At the same time, such permissibility should be balanced against the well-established principle that the integrity of the merits must be preserved and not prejudged or predetermined at the preliminary objections phase. To be sure, this principle and, indeed, the division of proceedings into jurisdictional and merits phases are not ends in themselves but they are indispensable tools for the fair and proper administration of justice and can be tampered with only at peril to those ideals and to the judicial function itself. �The effects and the implications of coercion in international relations are of such gravity that the Commission felt that a consent so obtained must be treated as absolutely void in order to ensure that the victim of the coercion should afterwards be in a position freely to determine its future relations with the State which coerced it. To admit the application of the present article [the draft Article that became Article 45 of the Vienna Convention on the Law of Treaties on acquiescence] in cases of coercion might, in its view, weaken the protection given by articles 48 and 49 to the victims of coercion.� (Draft Articles on the Law of Treaties with Commentaries, Yearbook of the International Law Commission, 1966, Vol. II, pp. 239-40). 6. With great respect to the majority view -- or belief -- for the paragraph starts by stating that �the Court believes�, it can be said that anyone persuaded by the logic of this paragraph will be persuaded by any argument. No attempt is made to explain why it is inimical to the interests of the good administration of justice to leave to the merits stage the central question of whether the 1928 Treaty and the 1930 Protocol were valid and hence settled the dispute (referred to in the best traditions of oratio obligua as �disagreement� or �controversy�). Nor is there anything in the subject matter of the dispute that would suggest irreversibility or perishability and hence warrant haste. Nor has there been a delay in justice for �the case became ready for hearing in respect of the preliminary objections� only in 2004 (Judgment, paragraph 6) -- a normal delay by the standards of other cases before this Court. Nor can justification be found in the general proposition that preliminary points should be dealt with and eliminated before moving to the merits for that presupposes that they have an exclusively preliminary nature. 7. In short, no element in the paragraph, whether expressly stated or implied therein, comes near an answer to Nicaragua�s contention that �[it] is difficult to find a better example of an objection that �does not possess, in the circumstances of the case, an exclusively preliminary character�� (Judgment, paragraph 46). 9. The paragraph rests on a number of misconceptions: it posits a non-existent presumption in favour of the Party making the objections. Article 79, paragraph 9, of the Rules of Court - recalled in paragraph 48 of the Judgment - states that the Court �shall either uphold the objection, reject it, or declare that the objection does not possess, in the circumstances of the case, an exclusively preliminary character�. It is plain that the third possibility, i.e., declaring the objection not to be of an exclusively preliminary nature, carries as much weight, and constitutes as much an answer to the objection in question as the first two, although it entails delaying the answer to the objection until the merits phase. 10. In other words, the party making the preliminary objections is, of course, entitled to an answer within the meaning of Article 79, paragraph 9, of the Rules of Court, but it is not entitled to a positive answer in all circumstances. (b) that by giving an answer it will determine the dispute, or some elements thereof, on the merits. In the same paragraph the Court comes to the conclusion that it found itself in neither situation and therefore goes on to pronounce on the validity of the Treaty and the Protocol. With respect, nothing is more debatable. I have already indicated that, in my opinion, the Court did not appraise itself as it should have of the necessary facts (paragraph 5). I can only add, by way of example, that no recourse was made to the negotiating history of the Pact of Bogota which would have shed light on the historical background necessary to come to a reasoned interpretation of what was meant by the terms �settled� or �governed�; nor was there any consideration of the important and relevant question of inter-temporal law, namely whether by 1928, the strong body of opinion which held �that treaties brought about by the threat or use of force should no longer be recognized as legally valid� FN2, had attained the status of customary law. Such consideration would have been indispensable because Nicaragua did not contest the factual existence of the Treaty and Protocol nor their relevance to the Pact of Bogota; it impinged the very validity of the Treaty and Protocol themselves. In other words, it questions the first premise on which Colombia based its contention that the Treaty and Protocol settled or governed the present dispute within the meaning of Article VI of the Pact of Bogota. FN2 Draft articles on the Law of Treaties with Commentaries, Yearbook of the International Law Commission, 1996, Vol. II, p.246. 12. With regard to the second criterion, i.e. that the answer should not determine the dispute on the merits, the Judgment sought to avert this eventuality by resort to the simple device of first defining the subject-matter of the dispute narrowly so as to exclude the status of the Treaty and Protocol from its ambit. Indeed, in the present case I cannot find any well-founded reasons for the defining of the subject-matter of the dispute in complete disregard of the submissions of Nicaragua. �Nicaragua submitted that issues relating to the validity and alleged termination of the 1928 Treaty as well as the question whether the Treaty and its 1930 Protocol covered or resolved all the contentious matters between the Parties, including the geographical scope of the San Andres Archipelago, sovereignty over Roncador, Quitasue�o and Serrana and maritime delimitation, all formed part of the dispute before the Court . . .
15. This reasoning gives rise to a fundamental question: can an issue (the validity of the 1928 Treaty) central to the resolution of a question acknowledged to be in dispute between the Parties on the merits (sovereignty over the named islands of the San Andres Archipelago) not be part of the subject-matter of the dispute? The answer must obviously be not. �that the objection is so related to the merits, or to questions of fact or law touching the merits, that it cannot be considered separately without going into the merits (which the Court cannot do while proceedings on the merits stand suspended under Article 62), or without prejudging the merits before these have been fully argued� (Barcelona Traction, Light and Power Company, Limited (Belgium v. Spain), Preliminary Objections, Judgment, I.C.J. Reports 1964, p. 43). FN3 For an earlier well-reasoned case in this respect see Oil Platforms (Islamic Republic of Iran v. United States of America), Preliminary Objection, I.C.J. Reports 1996 (II), separate opinion of Judge Shahabuddeen, pp. 824-825. 18. Lastly, it is obvious to me that the jurisdiction of the Court under Article 36, paragraph 2 of its Statute is both independent of and wider than the jurisdictional system erected by the Pact of Bogota. Nevertheless, to establish its jurisdiction in this concrete case, the Court would have been forced, had it started with the optional clause jurisdiction, to deal with the question of whether there existed a �legal dispute� between the Parties. As the Court notes in paragraph 138 of its Judgment, the question of whether the 1928 Treaty settled the dispute brought before the Court is, thus, equally relevant to determining the Court�s jurisdiction under the optional clause as it is to determining the Court�s jurisdiction under the Pact of Bogota. For the reasons set out in my opinion above, however, it is also my view that the decision in paragraph 138 of the Judgment that there is no �extant legal dispute between the Parties� is a decision so interwoven with the merits that it should have been left to be determined at the merits stage. 19. In this context, it is worth emphasizing that in no case decided by the Permanent Court of International Justice or this Court has the plea that there is no legal dispute within the meaning of Article 36, paragraph 2, of the Statute been accepted in limine litis. Rather such questions have always been deferred to the merits FN4. Further, it should be noted that the citation from the South West Africa case in paragraph 138 of the Judgment on which the Court relies in part to hold that there is no extant dispute between the Parties is incomplete. The quote omits the very important statement that a dispute exists if it can be �shown that the claim of one party is positively opposed by the other� (South West Africa Ethiopia v. South Africa; Liberia v. South Africa) Preliminary Objections, Judgment, I.C.J. Reports 1962, p. 328). The test of whether there exists a dispute is thus one of opposability and not of unfettered freedom for the Court. In this case it seems undeniable that Nicaragua�s claim that the 1928 Treaty is invalid is positively opposed by Columbia. FN4 See Shabtai Rosenne, The Law and Practice of the International Court 1920-2005, 2006, Vol. II, para. II.195. 1. Notwithstanding my vote in favour of the operative clause of the Judgment, I feel it necessary to make the following point. 2. Paragraph 136 of the Judgment states: �the Court considers that the provisions of the Pact of Bogota and the declarations made under the optional clause represent two distinct bases of the Court�s jurisdiction which are not mutually exclusive�. 3. The conclusion reached in paragraph 136 is supported by making reference to the Judgment in the case Border and Transborder Armed Actions (Nicaragua v. Honduras), Jurisdiction and Admissibility (I.C.J. Reports 1988, p. 85, para. 36) and to a quotation from the 1939 Judgment of the Permanent Court in the case Electricity Company of Sofia and Bulgaria (Belgium v. Bulgaria) (P.C.I.J., Series A/B, No. 77, p. 76). 4. However, the Armed Actions decision does not support this conclusion in the present Judgment, because as is indicated in paragraph 134, �the Court was merely responding to and rejecting the arguments by Honduras�. 5. The quotation from the Electricity Company of Sofia and Bulgaria (Belgium v. Bulgaria) Judgment of 1939 is not applicable, because in the present case there is no �multiplicity of agreements concluded accepting the compulsory jurisdiction� of the Court. 6. As indicated in paragraph 122 of the Judgment, Nicaragua and Colombia made declarations on 24 September 1929 and 30 October 1937 respectively, under Article 36 of the Statute of the Permanent Court of International Justice, which are deemed to be acceptances of the compulsory jurisdiction of this Court under Article 36, paragraph 5, of its Statute. However, they made a new declaration under Article 36, paragraph 2, of the Statute of the Court as prescribed in Article XXXI of the Pact of Bogota when they ratified the latter in 1950 and 1968 respectively. In my opinion, it is not possible for two different declarations to continue to be simultaneously in force in the relations between Nicaragua and Colombia, because the second declaration necessarily replaced the first one in their reciprocal relations. 7. Therefore I consider that the optional clause declarations made by Nicaragua and Colombia in 1929 and 1937 respectively are no longer in force, and for this reason they cannot be invoked as a basis for the jurisdiction of the Court. While I consider the present Judgment generally satisfactory, I have my doubts whether the Court has applied Article VI of the Pact of Bogota to the Treaty concluded between Nicaragua and Colombia in 1928 in a correct way. In the same context, I have considerable difficulties with the Court�s reading of the relationship between, on the one hand, the notion of a matter being �governed by . . . treaties in force� at the time of the conclusion of the Pact in 1948 and that of the continued existence of a �legal dispute� as a precondition for the jurisdiction of the Court on the basis of a declaration of acceptance under the optional clause on the other. I would submit that this conclusion is problematic. What I mean by this is not that the Court should have said more (or rather, anything) about the well-foundedness vel non of the two grounds of invalidity invoked by Nicaragua as such instead of focusing exclusively on the loss of the right to such invocation. To do so this would not have been possible at the present, jurisdictional, stage of the proceedings (even as it stands, the present Judgment is a borderline case with regard to the way in which it purports to limit its scope to questions of jurisdiction while at the same time undertaking frequent, though extremely cursory, visits to issues clearly belonging to the merits). Rather, what I am aiming at is the character of the Court�s above conclusions as a non sequitur. To say that Nicaragua, by its behaviour concerning the 1928 Treaty somehow forfeited the right to invoke its invalidity, is one thing; to go on from there to find that, for the same reasons, the Treaty was actually valid and in force on the date of the conclusion of the Pact of Bogota in 1948, is quite another. In my view, the second conclusion does not follow from the first. I do agree with the Court�s first finding to the effect that, since Nicaragua treated the 1928 Treaty as valid for such a long period of time, it cannot suddenly change its position and claim the instrument�s invalidity ab initio. I am of course aware that in taking this position one will encounter several difficulties arising under the law of treaties -- let me just mention that Article 45 (b) of the Vienna Convention of 1969 FN1 excludes from its scope the case of coercion of a State by the threat or use of force, or that the applicability of the Vienna Convention�s Article 46 presupposes that the violation of internal law in question be manifest and concerned a constitutional rule of fundamental importance. Awareness of these problems might be the reason for the Court somewhat coyly avoiding the terminology used by the Vienna Convention (�invoking . . . as a ground�) and instead saying that Nicaragua �cannot today to be heard to assert� invalidity. Without straying too far into the terrain reserved for the merits stage of the case, as concerns the chances of success of the two arguments on invalidity (or lack thereof), I think that the Court would not have had to be so cautious. The principle underlying Article 45 (b) of the Vienna Convention is undoubtedly applicable under the present circumstances: by its past behaviour, Nicaragua can no longer rely on the invalidity of the 1928 Treaty -- under the system of the Pact of Bogota, that is. Expressed in more precise terms: what Nicaragua is prevented from claiming now is that the Treaty of 1928 was not a treaty �in force� (within the meaning of Article VI of the Pact of Bogota) at the date of the conclusion of the Pact. Further, Nicaragua cannot any longer contend that the matter �settled� by that Treaty, i.e., sovereignty over the islands of San Andres, Providencia and Santa Catalina, was not to be seen as definitively resolved and could still come before the Court on the basis of the Pact of Bogota. According to the majority of the Court, however, what follows from Nicaragua�s behaviour vis-�-vis the Treaty is something more radical, namely that the Treaty �was valid and in force� in 1948, purely and simply. Thus, apparently the circumstances that led to the grounds of invalidity not any longer being invokable, also are held to have erased the invalidity as such. This is a result which, as a matter of theory, I find difficult to agree with. Within the framework of Colombia�s first preliminary objection it led the Court to uphold the objection, that is, to accept that access by Nicaragua to the Court on the basis of the Pact of Bogota was barred with regard to the issue of sovereignty over the three islands mentioned. The Court could readily have reached the same result by following the line of reasoning that I pursue here: viewed within the framework of the Pact of Bogota, Nicaragua forfeited the opportunity to bring the matter before the Court. �The Court�s acknowledgment of the fact that sovereignty over the three islands was attributed to Colombia under the 1928 Treaty was made for the purposes of ascertaining whether or not the Court had jurisdiction over the matter under the Pact of Bogota. However, the very fact that the dispute on the question of the sovereignty over the three islands has been settled by the 1928 Treaty is equally relevant for the purposes of determining whether the Court has jurisdiction on the basis of the optional clause declarations. In this regard, the Court notes that Article 36, paragraph 2, of the Statute expressly requires that, in order for the Court to have jurisdiction on the basis of optional clause declarations, there must exist a �legal dispute� between the Parties. The Court then concludes that, in light of the foregoing, no practical purpose would be served by proceeding further with the matters of the Colombian termination of its declaration and its reservation ratione temporis (Judgment, para. 139). What this reasoning amounts to is that, with the question of sovereignty over the three islands �settled� by the 1928 Treaty according to the mechanisms of the Pact of Bogota (forfeiture preventing the Nicaraguan claim of invalidity of the 1928 Treaty; the Treaty therefore held to be �valid and in force� and the Court�s jurisdiction thus excluded), there is no �legal dispute� in regard to the islands left to decide on the basis of the optional clause declarations either. In my view and as a matter of principle, this is erroneous. If the two bases of jurisdiction -- first, the Pact of Bogota and, second, the declarations of the two Parties on the basis of the optional clause -- are to be seen as distinct and not mutually exclusive (in this sense, correctly, paragraph 136 of the Judgment), the first cannot simply eclipse the second. Any objective determination of the matter must lead us to conclude that there still persists a dispute including the appurtenance of the three islands in the sense of the Court�s case law, that is, �a disagreement on a point of law or fact, a conflict of legal views or interests between two persons� (Mavrommatis Palestine Concessions (Greece/United Kingdom), Judgment No. 2, 1924, P.C.I.J., Series A, No. 2, p. 11), the claim of one party being positively opposed by the other, etc. Thus, the Court, after having reached a negative result with regard to the first base of jurisdiction claimed by Nicaragua, ought to have continued the examination of its jurisdiction by turning to the optional clause declarations of the Parties, with a view to seeing whether these declarations could provide a jurisdictional basis for the decision of matters excluded from the Court�s purview on the basis of the Pact of Bogota. If, subsequently, the Court had followed the arguments put forward by Colombia and granted the reservation ratione temporis to its Article 36, paragraph 2, declaration the desired effect, or had accepted Colombia�s termination of its subjection to the Court�s jurisdiction as admissible, the question of jurisdiction with regard to the controversy over the three islands would have been finally settled in the negative. In the alternative, this controversy would have been included in the list of issues that the Court allows to proceed to the merits stage. Thus, at that stage, Nicaragua would have had the opportunity to argue fully the two grounds of invalidity put forward with regard to the 1928 Treaty and present the reasons, if any, why it had not relied on these grounds before. In this connection let me clarify that I have undertaken this short enquiry into the relationship between the two bases of jurisdiction claimed by Nicaragua simply because I could not be convinced of the correctness of the Court�s application of the law in this regard, and in no way out of any belief that the Nicaraguan arguments concerning the invalidity of the 1928 Treaty, as to their substance, came off too badly in the present Judgment. 1. I have voted in favour of the Court�s Judgment. Nevertheless, some aspects of the case and of the present Judgment call for a few observations. 2. Nicaragua invoked, in its Application, two bases of jurisdiction of the Court. First, it relies on Article 36, paragraph 1, of the Statute which states, inter alia, that �[t]he jurisdiction of the Court comprises . . . all matters specially provided for . . . in treaties and conventions in force�. In Nicaragua�s view, the American Treaty on Pacific Settlement, officially known as the Pact of Bogota, is such a treaty. Second, Nicaragua further relies on Article 36, paragraph 2, of the Statute arguing that the jurisdiction of the Court also exists by virtue of the operation of the declaration of Nicaragua dated 24 September 1929 and the declaration of Colombia dated 30 October 1937 recognizing as compulsory the jurisdiction of the Court. 3. Colombia denies that the Court has jurisdiction on either of these two bases. 4. Colombia refers to Article VI of the Pact of Bogota, which provides that the procedures of pacific settlement envisaged in the Pact, including the judicial procedure before the International Court of Justice, �may not be applied to matters already settled by arrangement between the parties . . . or which are governed by agreements or treaties in force on the date of the conclusion of the present Treaty�; i.e. in 1948 when the Pact was concluded. It argues that the Treaty concerning Territorial Questions at Issue between Colombia and Nicaragua of 24 March 1928 (hereinafter �the 1928 Treaty�) has been in force since 1930 and that it governs the matters submitted by Nicaragua to the Court. Therefore, in Colombia�s view, Article VI of the Pact of Bogota prevents the application of the judicial procedure before this Court in the present case and the Court should declare itself to be without jurisdiction. 5. Nicaragua argues that the Treaty was not in force since, in its view, it was not validly concluded. Nicaragua denies the validity and the entry into force of the 1928 Treaty, despite the fact that it not only signed a Protocol of Exchange of Ratifications on 5 May 1930 but also registered the 1928 Treaty (with the Protocol of Exchange) in 1932 with the League of Nations. 6. Nicaragua invokes two grounds for the invalidity of the 1928 Treaty. First, it alleges that the 1928 Treaty was concluded in manifest violation of the Nicaraguan Constitution then in force FN1. Second, it contends that the Nicaraguan Government was deprived of its international capacity during the pertinent period since it could not freely express its consent to be bound by international treaties (Memorial of Nicaragua, p. 108, para. 2.102; Written Statement of Nicaragua, p. 15). FN1 It may be noted that it is not the first time that Nicaragua has argued the alleged violation of its Constitution as a ground for invalidating an international treaty it had concluded. Thus in the arbitration with Costa Rica, Nicaragua invoked, among others, this argument in support of its claim that the 1858 Treaty of Limits with Costa Rica was invalid. The arbitrator in his Award of 22 March 1888 found that the 1858 Treaty of Limits was valid. See H. Lafontaine, Pasicrisie internationale 1794-1900, Histoire documentaire des arbitrages internationaux, Berne 1902, (repr. by Martinus Nijhoff Publishers, The Hague 1997, pp. 299-301), J. B. Moore, International Arbitrations To Which the United States Has Been a Party, Vol. II, Washington 1898, pp. 1964-1967. 7. Nicaragua takes the view that the Court cannot pronounce itself, at this stage of the proceedings, whether the Treaty was validly concluded and has been in force, since those issues belong to the merits of the dispute. In Nicaragua�s view, Colombia�s preliminary objection to the jurisdiction of the Court on the basis of the Pact of Bogota does not possess an exclusively preliminary character. 8. It would have been all too convenient for the Court to defer its decision on Colombia�s objection to the Court�s jurisdiction under the Pact of Bogota. But in a situation where the issue of the validity of the 1928 Treaty and its entry into force has been determined by the Court as not constituting the subject-matter of the dispute (which consists of sovereignty over the disputed islands and other maritime features, and of maritime delimitation), and the Court has at its disposal sound legal grounds to rule on the objection, the proper administration of justice and procedural economy justify the Court upholding or rejecting the objection already at this stage. 9. I concur with the view of the Court that Nicaragua, for an extended period of more than 50 years, has treated the 1928 Treaty as valid and never contended that it was not bound by it (Judgment, para. 79). Nicaragua, by its conduct over those years, must be considered as having acquiesced in the validity of the 1928 Treaty and its maintenance in force. Therefore it may no longer invoke the alleged manifest violation of its Constitution of 1911 as a ground for invalidating the 1928 Treaty. 10. The second ground for the invalidity of the 1928 Treaty invoked by Nicaragua is that its government was deprived of its international capacity during the pertinent period, since it could not freely express its consent to be bound by international treaties. Although mentioned in the Judgment, this argument receives a rather cryptic response from the Court. It seems that it has been dealt with in the same way as the argument based on the manifest violation of the Nicaraguan Constitution. In fact, there is a common response to both of these arguments in the Judgment (paras. 78, 79 and 80). While I have concurred with the view of the majority as far as the first ground of invalidity is concerned, I consider that the second ground requires a different response in view of the difference in nature between the two grounds invoked. The International Law Commission, in its commentary to what has become Article 45 of the 1969 Vienna Convention, excluded the case of coercion from the application of the principle that the State may, on account of its subsequent conduct, lose a right to invoke the invalidity of a treaty. It stated that in the case of coercion �a consent so obtained must be treated as absolutely void in order to ensure that the victim of the coercion should afterwards be in a position freely to determine its future relations with the State which coerced it� (Yearbook of the International Law Commission, 1966, Vol. II, p. 239; emphasis added). 11. The argument advanced by Nicaragua is not without difficulties. If it is to be understood broadly, generally, then it would run counter to the other basis of the Court�s jurisdiction invoked by Nicaragua, i.e., the optional clause declaration under Article 36, paragraph 2, of the Statute. Nicaragua made such a declaration in 1929, exactly in the pertinent period when its government, as it is now alleged, was deprived of its international capacity. When in 1984 Nicaragua instituted proceedings in the Military and Paramilitary Activities in and against Nicaragua (Nicaragua v. United States of America) case, the Court treated its declaration as valid and in force (see I.C.J. Reports 1984, p. 442, para. 113 (1)). In fact, in all proceedings involving Nicaragua before the Court in the past, its optional clause declaration of 1929 was relied on as a basis of the Court�s jurisdiction (see, for example, Arbitral Award Made by the King of Spain on 23 December 1906 (Honduras v. Nicaragua), Judgment, I.C.J. Reports 1960, p. 194; Border and Transborder Armed Actions (Nicaragua v. Honduras), Judgment, I.C.J. Reports 1988, p. 71, para. 1, p. 82, para. 25; Territorial and Maritime Dispute between Nicaragua and Honduras in the Caribbean Sea, Judgment of 8 October 2007, para.1). Such a broadly construed argument cannot be accepted, since it is contradicted by the findings made by the Court in previous cases involving Nicaragua. 12. Nicaragua itself admits that it was not prevented from concluding international treaties in general (CR 2007/19, p. 11, para. 13). But then it is difficult to accept its contention that the Nicaraguan Government was deprived of its international capacity during the relevant period. Nicaragua therefore specifies that while it was under occupation by the United States, it was prevented from concluding treaties that ran against the interest of the United States and from rejecting the conclusion of treaties that the United States demanded it to conclude. The interests of a third State, even its demand to conclude a treaty, do not render such a treaty null and void ab initio. That could only be a consequence if a State was coerced to conclude a treaty by the threat or use of force in violation of the principles of international law. It seems that that is what Nicaragua suggests when it refers to Article 52 of the Vienna Convention on the Law of Treaties, which provides that �[a] treaty is void if its conclusion has been procured by the threat or use of force in violation of the principles of international law embodied in the Charter of the United Nations�. 13. The issues raised by Nicaragua in its argument are complex. They relate both to facts and law, including the law of treaties applicable at the time of the conclusion of the 1928 Treaty. Nicaragua acknowledged that, when it observed that �the 1928 Treaty �must be appreciated in the light of the law contemporary with it� and that Law as expressed in the 1969 [Vienna] Convention has no retroactive effect� (Memorial of Nicaragua, p. 116, para. 2.124). Perhaps these issues could have been further elucidated if the Court had decided to join the consideration of the preliminary objection to the merits stage. But one fundamental problem of Nicaragua�s contention would still have remained. The Court would not have been able to reach a decision about the alleged coercion without examining the lawfulness of the United States conduct, when that State is not a party to these proceedings. A conclusion by the Court that there was coercion by the United States would be tantamount to a finding that this third State, which is not before the Court, had acted unlawfully. Principles governing the exercise of the Court�s jurisdiction prevent the Court from making such a finding. Even if the Court had jurisdiction, it would not have been able to exercise it (see East Timor (Portugal v. Australia), Judgment, I.C.J. Reports 1995, p. 105. para. 35). 14. Nicaragua also pursues another line of argument when it contends that Colombia �took advantage of the US occupation to extort from her the conclusion of the 1928 Treaty� (Memorial of Nicaragua, p. 98 , para. 2.82; CR 2007/19, pp. 10-11). It is sufficient to observe that the main principles of that Treaty were already discussed by Colombia with the Nicaraguan Government which was inaugurated on 1 January 1925, as Nicaragua admits, after �an election that had not been controlled by the United States� (Memorial of Nicaragua p. 76, para. 2.41). A draft Treaty was presented to Nicaragua�s Foreign Minister by Colombia�s Ambassador in Managua in March 1925. It appears from the case file that Nicaragua actively participated in the negotiation of that Treaty. It was Nicaragua which, after the signing of the 1928 Treaty, suggested an understanding about the geographical scope of the Archipelago of San Andres (see paragraph 64 of the Judgment). That agreed understanding was recorded in the 1930 Protocol of Exchange. 15. Accordingly, I concur with the Court that the issue of sovereignty over the islands of San Andres, Providencia and Santa Catalina is not to be adjudicated at the merits stage. 1. I agree with the decision of the Court and in essence with the reasons it gives. My principal purpose in preparing this declaration is to emphasize an important aspect of the function of the Court in deciding in accordance with international law disputes submitted to it. The Court has the power and the responsibility, when it may properly do so, to decide at a preliminary stage of a case a matter in dispute between the parties if deciding that matter will facilitate the resolution of the case. That power and responsibility arises from the principle of the good administration of justice, and is illustrated by the cases the Court cites in paragraph 49 of its judgment; it is also reflected in the broad terms of the first sentence of paragraph 1 of Article 79 of the Rules of Court, regulating preliminary objections, as originally adopted in 1972. The power and responsibility may be used to safeguard the rights and interests of the parties, particularly that which contends that a matter is no longer a live one. The Court should not leave unresolved for later and further argument a matter which in the particular circumstances of the case may be properly decided at that earlier stage. 2. The Parties disagree on the question whether the matter of sovereignty over the three named islands was settled by and in accordance with the terms of the 1928 Treaty. That question arises in respect of each of the two autonomous sources of jurisdiction invoked by Nicaragua. 3. I consider that the Court may properly decide, as it has and for the reasons it gives, that in terms of Article VI of the Pact of Bogota that matter of sovereignty was settled in favour of Colombia as at 1948. There was no extant dispute. For essentially the same reasons, to turn to the second head of jurisdiction, there is now no dispute in respect of that matter, as required by Article 36, paragraph 2, of the Statute of the Court and the Parties� declarations made under it, as again the Court rules. It follows that the Court does not have jurisdiction in respect of that matter under either head of jurisdiction invoked by Nicaragua. 4. In the first and third paragraphs I have used the adverb �properly� to indicate a limit on the power and responsibility to decide. As the Court has often declared, it must as a judicial body and a court of justice remain faithful to the requirements of its judicial character (e.g. Judgments of the Administrative Tribunal of the ILO upon Complaints Made against Unesco, Advisory Opinion, I.C.J. Reports 1956, pp. 77, 84). In particular, it must have before it the material which it needs to decide the matter according to law, and it must accord to each party equal rights to present its evidence and submissions on that matter and to rebut the material presented against it. I have no doubt that both requirements are satisfied in this case in respect of the matter relating to the three named islands on which the Court has ruled. While I fully agree with the operative part of the Judgment, I do not share the view that there is no �extant dispute� between the Parties on the question of sovereignty over the islands of San Andres, Providencia and Catalina and that therefore the Court does not have jurisdiction on the basis of the declarations made by the Parties according to Article 36, paragraph 2, of the Statute. It seems to me that the existence of a dispute can hardly be denied in view of the claim to sovereignty over the three islands made by Nicaragua in its submissions included in the Memorial. My reason for concluding that the Court has no jurisdiction with regard to the question of sovereignty over the three islands rests on the reservation in the Colombian declaration to the effect that this declaration �applies only to disputes arising out of facts subsequent to 6 January 1932�. If one considers the �facts which are the source of the dispute�, as the Court stated in its Judgment on the Right of Passage over Indian Territory (Portugal v. India) (Merits, I.C.J. Reports 1960, p. 35), all the facts relating to the content and validity of the 1928 Treaty predate 1932 since they concern the conclusion of that treaty. Thus, the part of the dispute concerning the islands that were attributed to Colombia by the 1928 Treaty lies outside the scope of the Court�s jurisdiction also in so far as it is based on the Parties� declarations under the optional clause. Nicaragua�s contention that the 1928 Treaty was terminated as a consequence of a breach committed by Colombia refers to facts that occurred after 1932. However, the adoption by Colombia of a wide interpretation of the scope of the 1928 Treaty as including maritime delimitation, even if incorrect, cannot conceivably constitute a material breach.